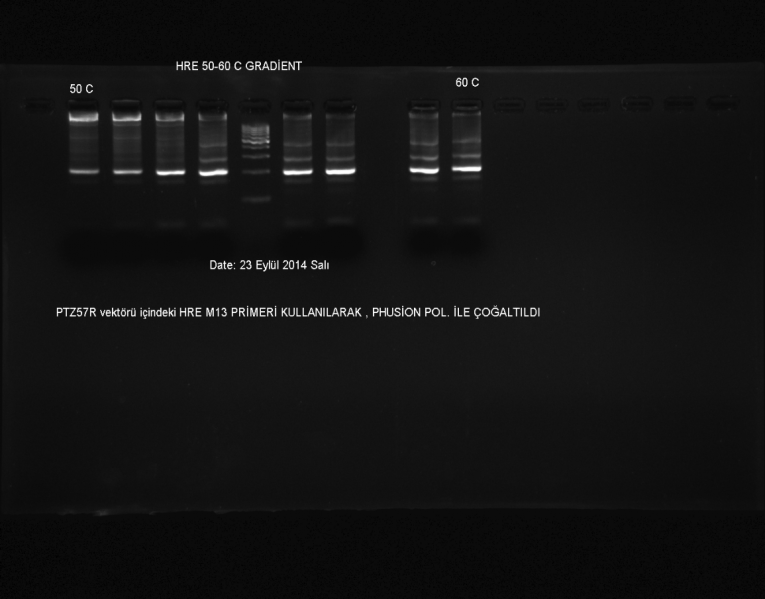 Then we prepared new competent cells for our Project and we ordered our primers . 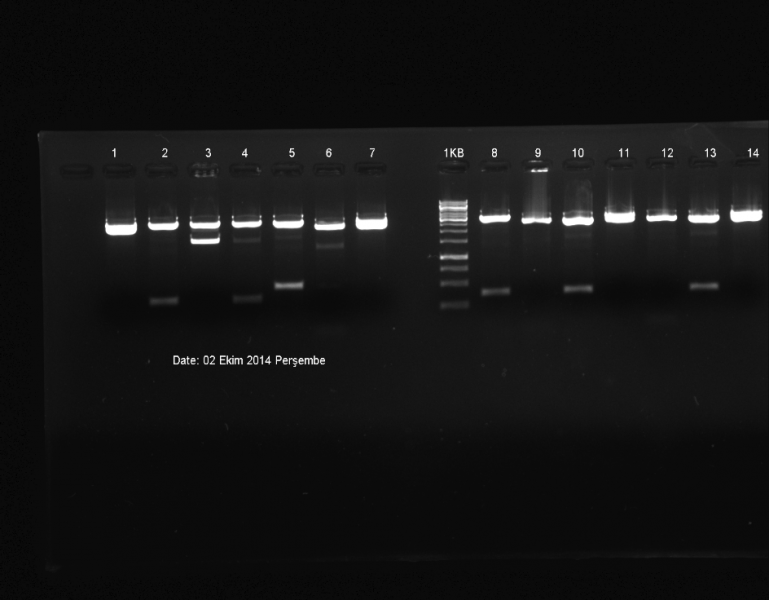 The ordered primers were taken this week. 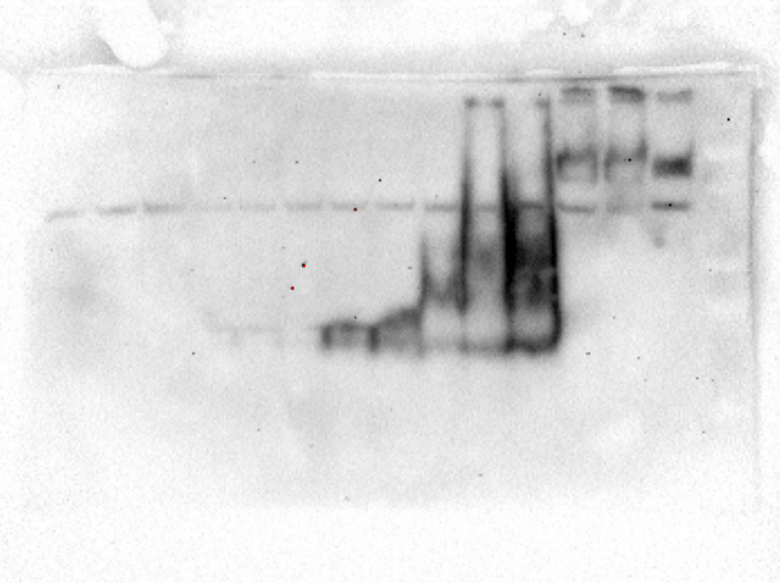 We would produce our biobricks, but the result was not like we expected after electrophoresis. 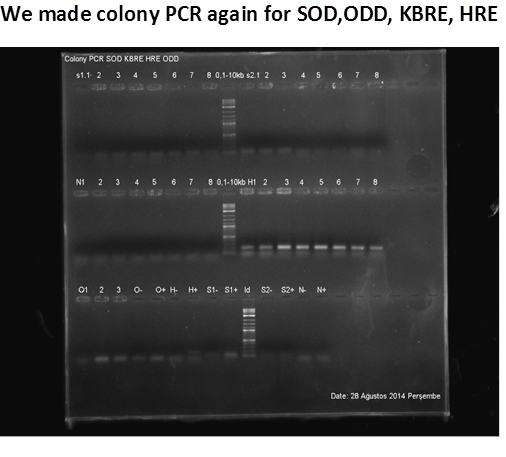 Then we made colony PCR and again do it for SOD and GPX. 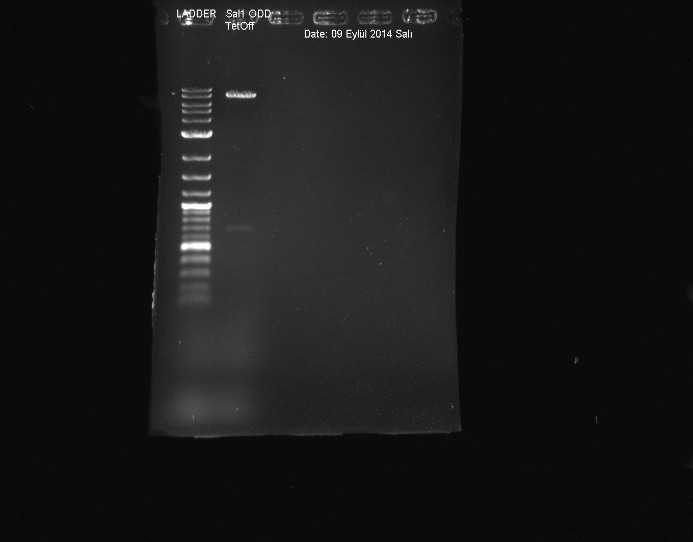 After this, we did digestion and also pTRE vector . 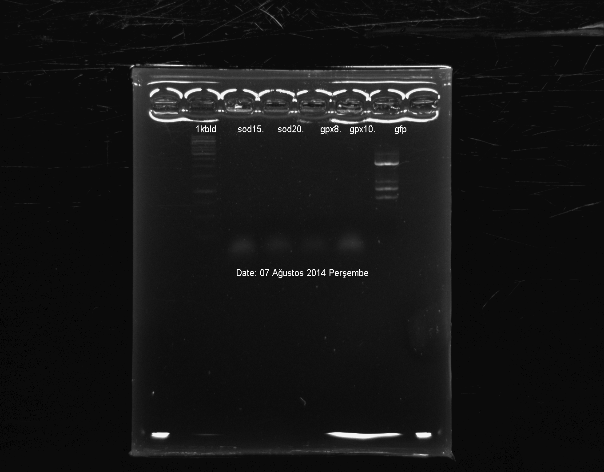 We prepared 14 pieces agar plates. 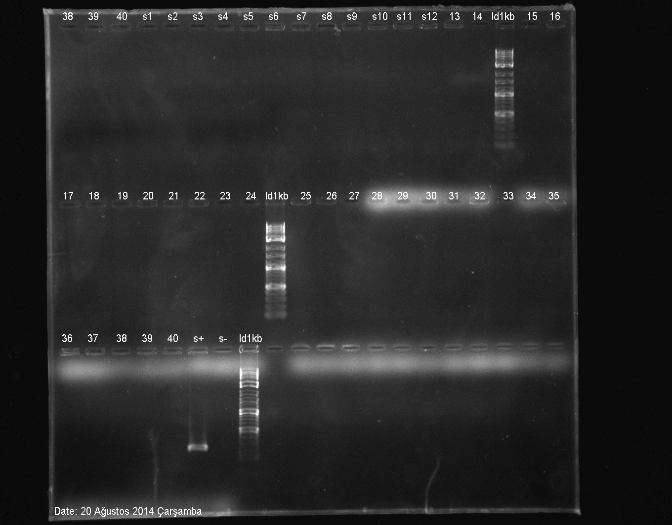 Plasmid isolation we did and gradient for PLAT and the optimal temparature was 62.4°. 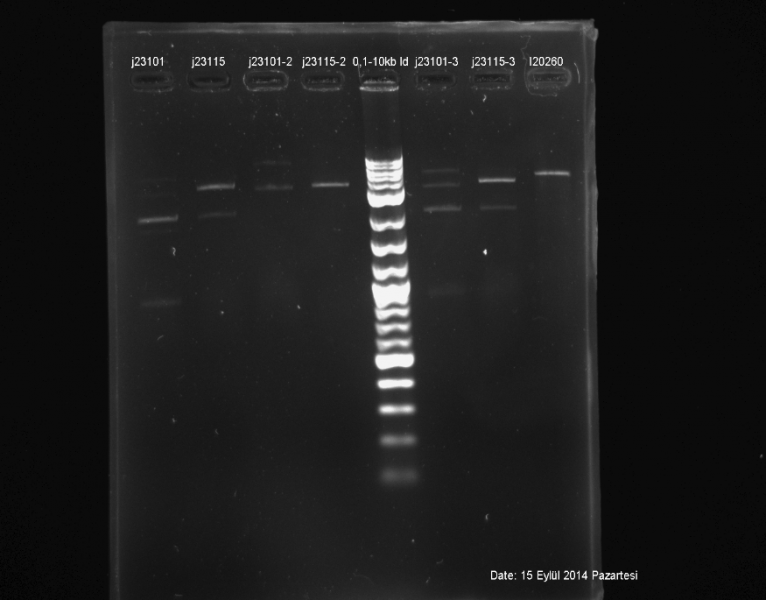 Therefore we did gel extraction for 1500-2000 bp bands. 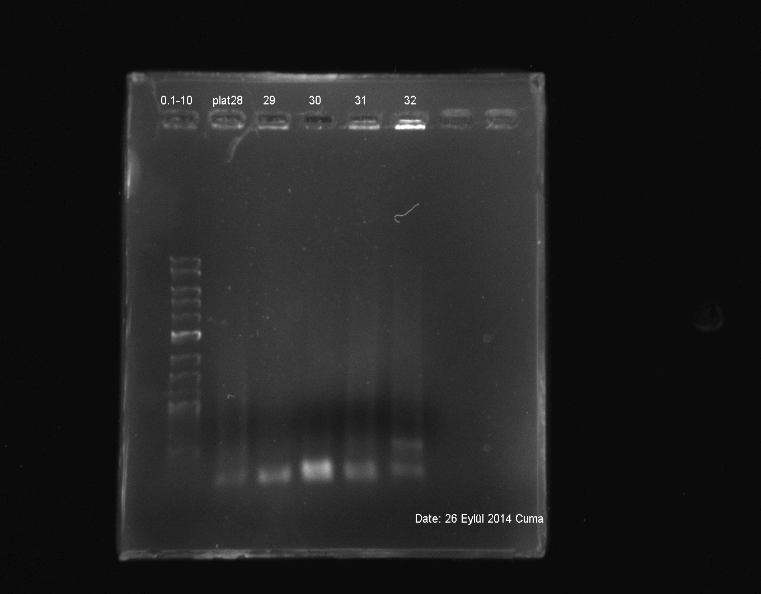 Prepared liquid culture for DH5α and Neb10 E.Coli streamsfor obtaining competent cell. 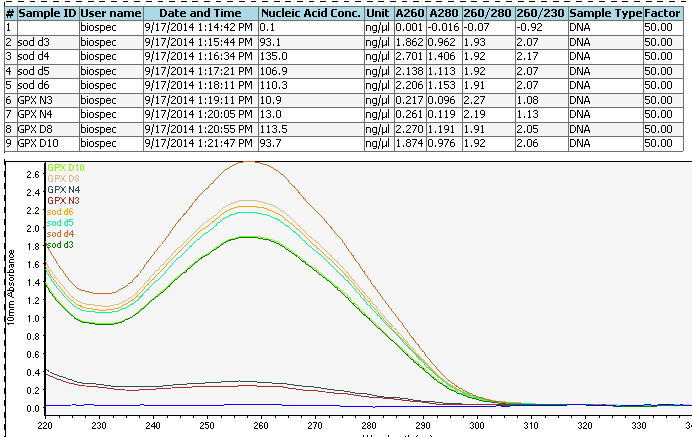 Replaced grown cultures into 200 ml LB solution. 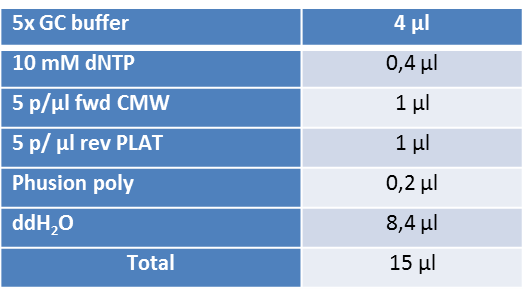 We did transformation efficiency for PLAT,SOD and GPX. 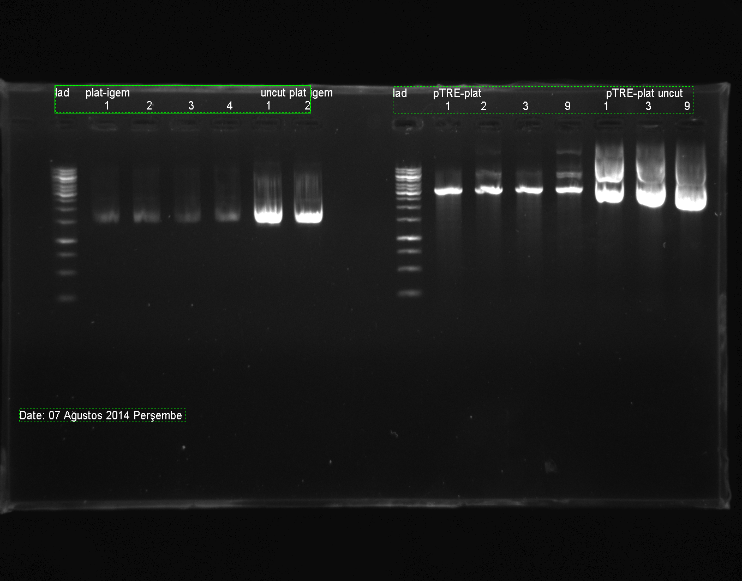 Gel extraction applied for PLAT and ligated with s3335(GFP) and after that transformed into our bacterias for cloning. Therefore we digested pTRE , GPX , and SOD with EcoRI and SpeI. 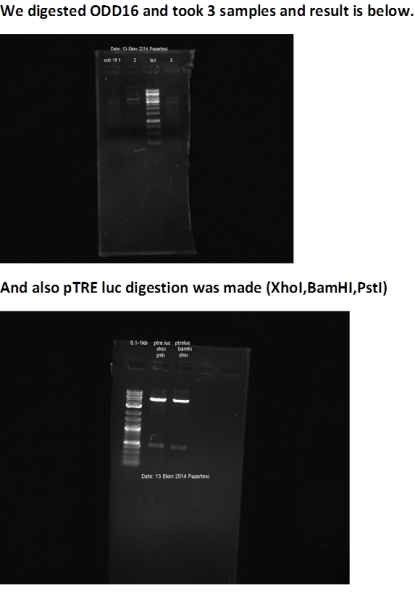 This week we digested BBa_K823012, psB1C3 (EcoRI and SpeI) and BBa_E0240 with XpaI and PstI and after that we did ligation psB1C3 with other our inserts, then transformation as usual. 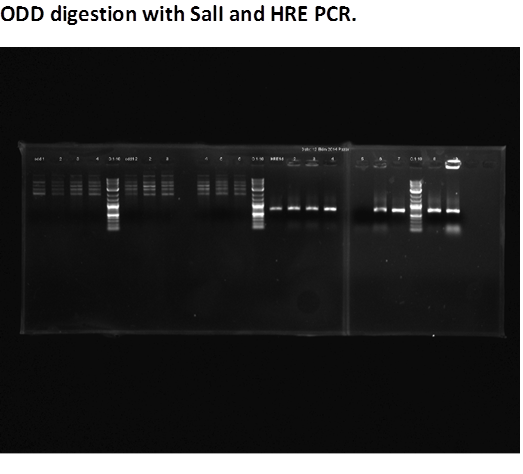 We found a new biobrick for our Project and we digested it, ODD and pTet-off with SalI. 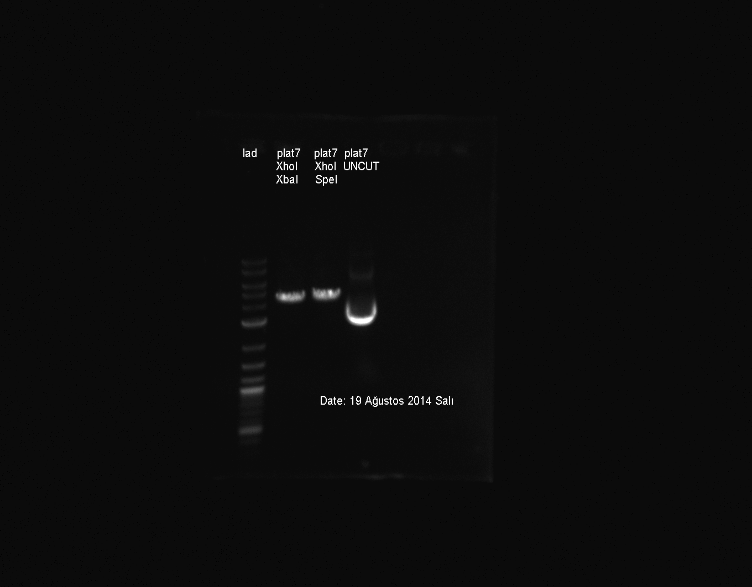 This week we tried our antibiotics and experienced our Kanamycin was broken . So we offered new one. 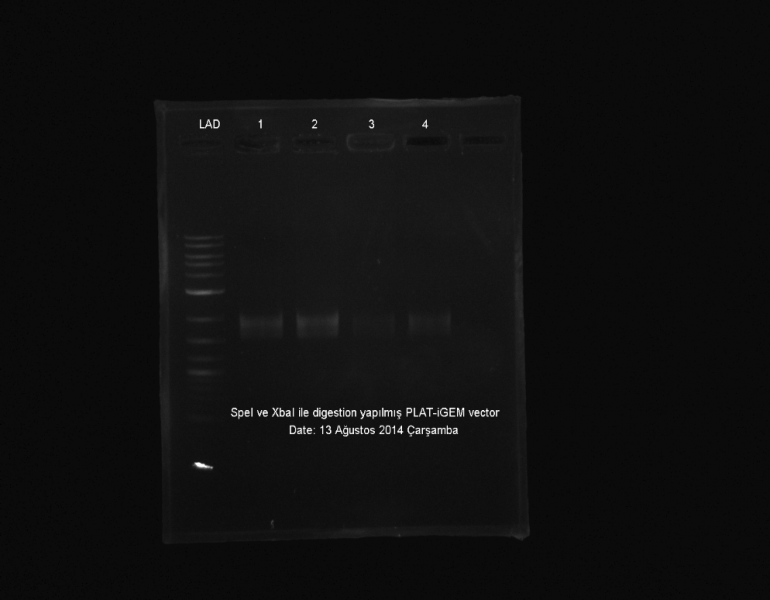 We digested Plat and iGEM vector(s3335) again and later ligated them. 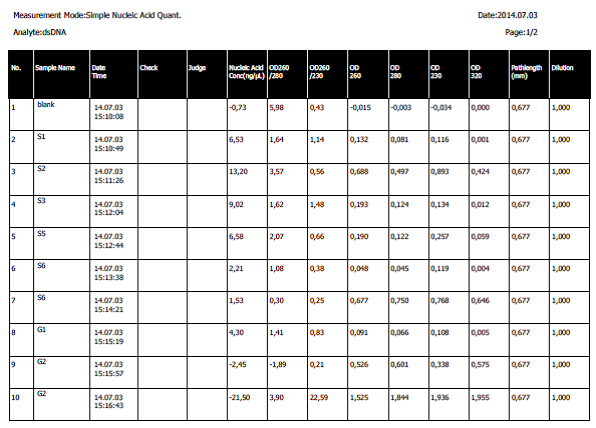 •	Transformation optimisation was made with 8 samples and we got this results. 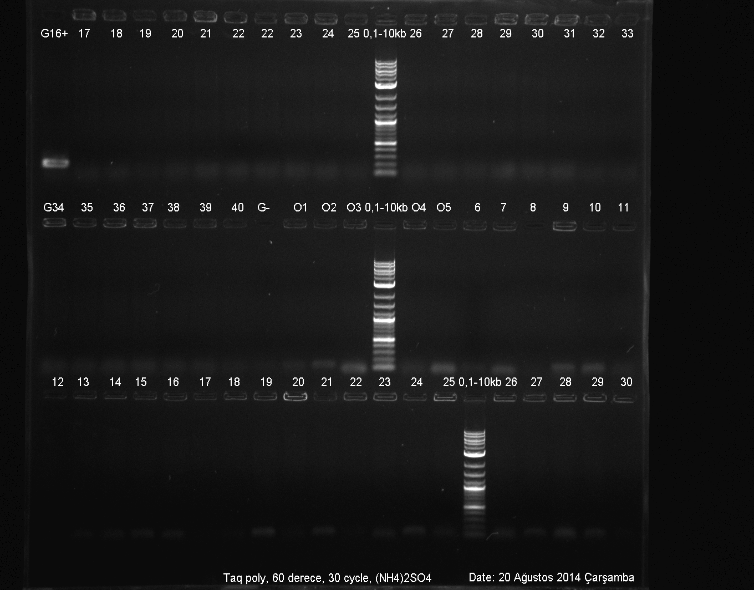 •	ODD,colony pcr was made. 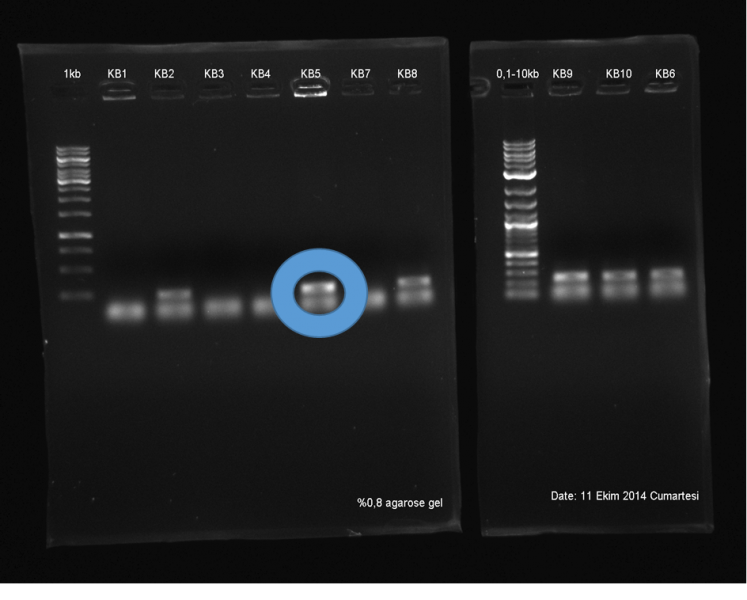 •	PLAT-pTRE, PLAT-iGEM cut check was made also.In PLAT-pTRE cut check, we used SpeI and XbaI but we saw some bands that unnecessary. 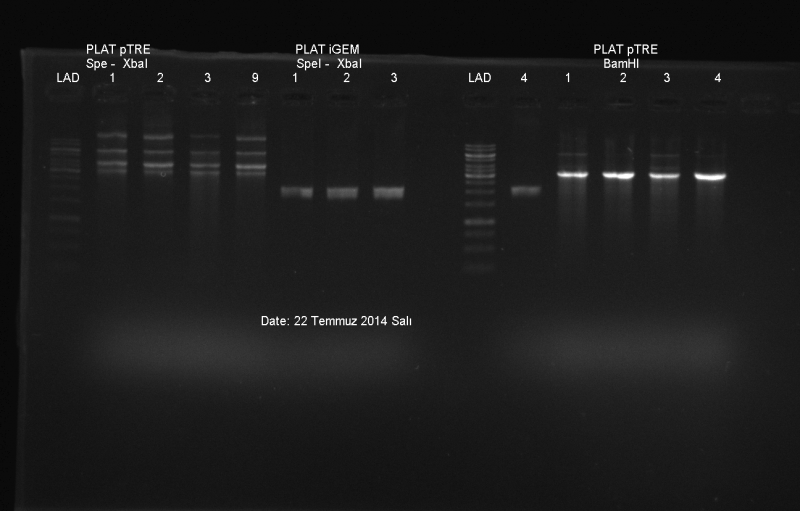 •	And also in PLAT-iGEM cut check we digested with BamHI. We saw 2 bands in electroforesis but they were not match with theoretical bands. 1. We hadn’t a Project name. 2. We hadn’t a Project scheme,Wiki,design. 3. 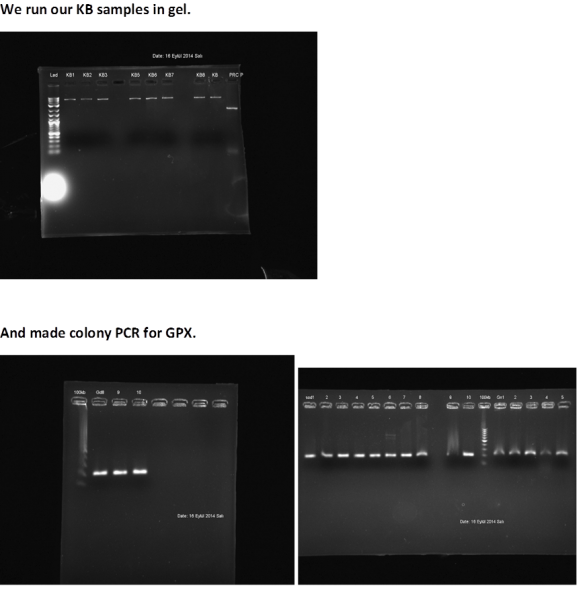 We had to share our experiments and lab experience via Facebook,Twitter. 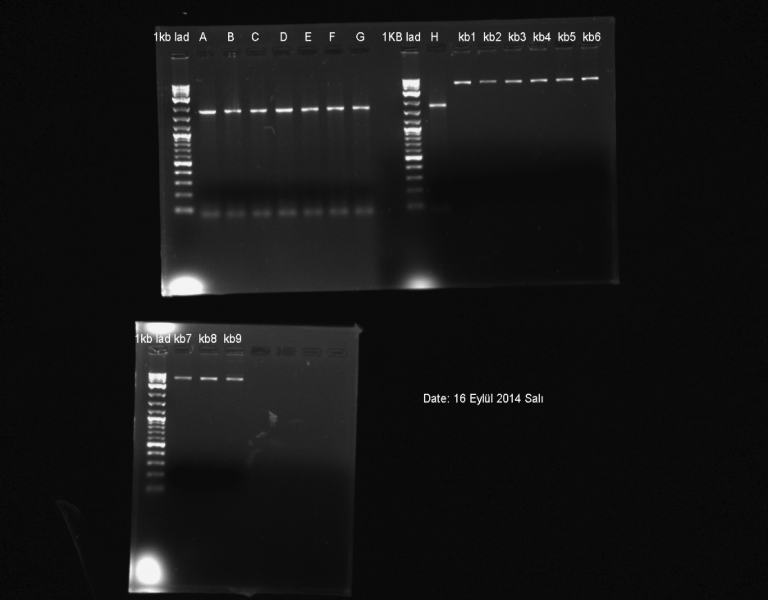 Part 1:BBa_J23101(promoter) cut with EcoRI and SpeI. 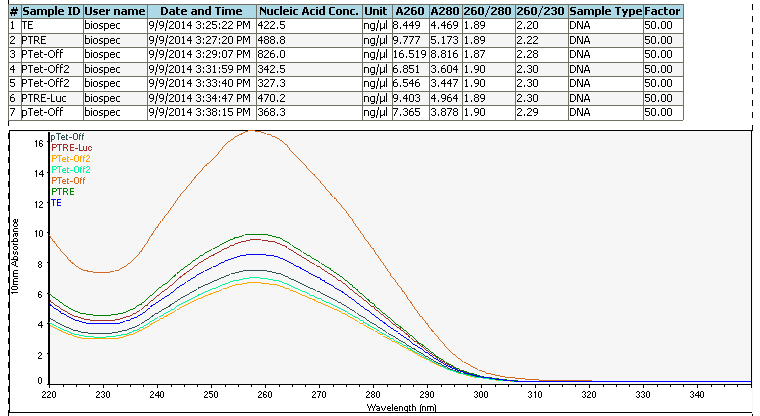 Part 2: BBa_E0240 (GFP reporter) cut with XbaI and PstI. Incubated them 30 mins and then 80° for 20 mnts. Part 2 was old sample. 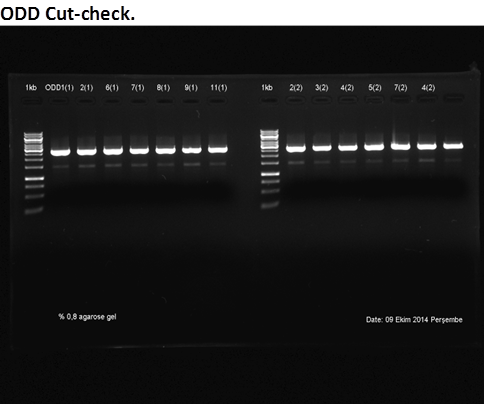 Result: Because of gene concentration and quality low, cut check didn’t Show up on monitoring after electrophoresis. Decision: Before digestion, cloning genes via transformation is required. 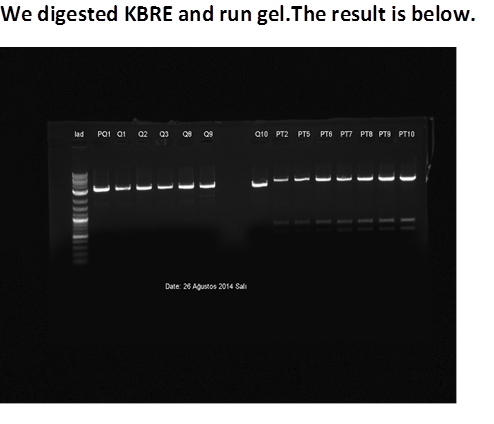 SOD and psB1C3 measured efficiency of gel extraction kit and didn’t get require results. 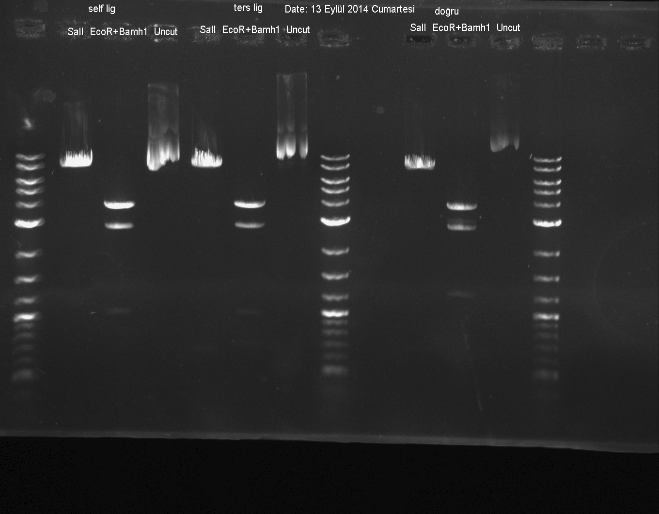 So we did electrophoresis again and examine our bands but they were too tiny. We didn’t get any result unfortunately. 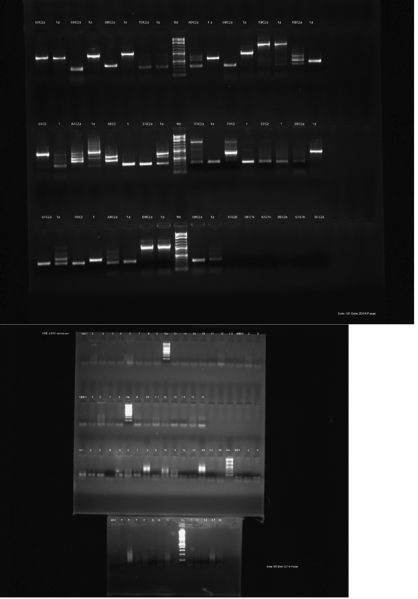 Transformation of J23101 and E0240 taken from plates. After 16 hours the colonies begin seeing in part 2 plate. But the other plate was empty untill 20 hours passed. Decision: Transformation was execuated again for part 1 plate. Additionally in case of we get result, these two parts would be taken from distribution kit and cut again. 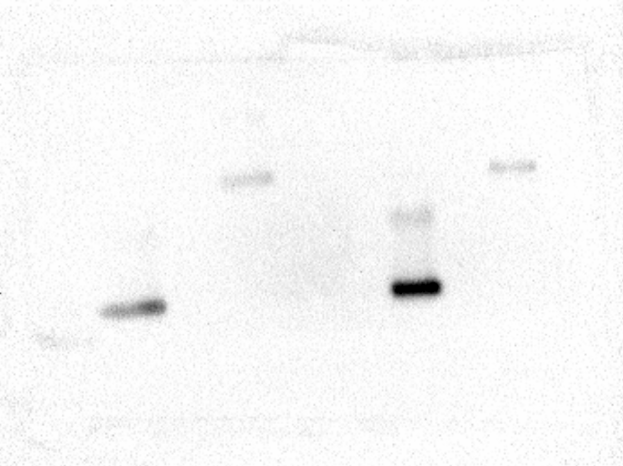 1.Competent cells stays in 10 min in ice. Briefly, we couldn’t see any colony in plates and we returned start line. 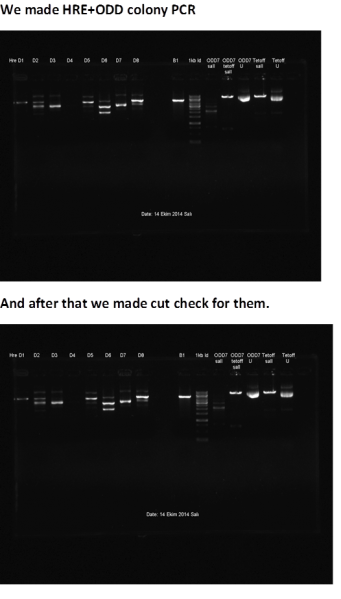 We also did Western Blot (15% SDS page). 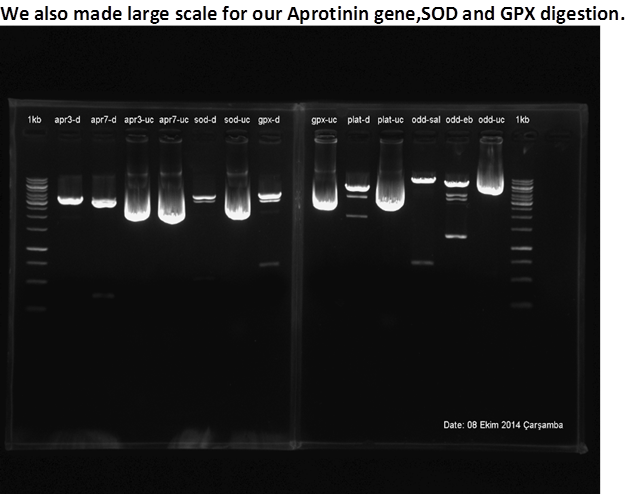 •	SOD-1 and GPX -1 ,our transfection samples PCR. We produced all of our genes. 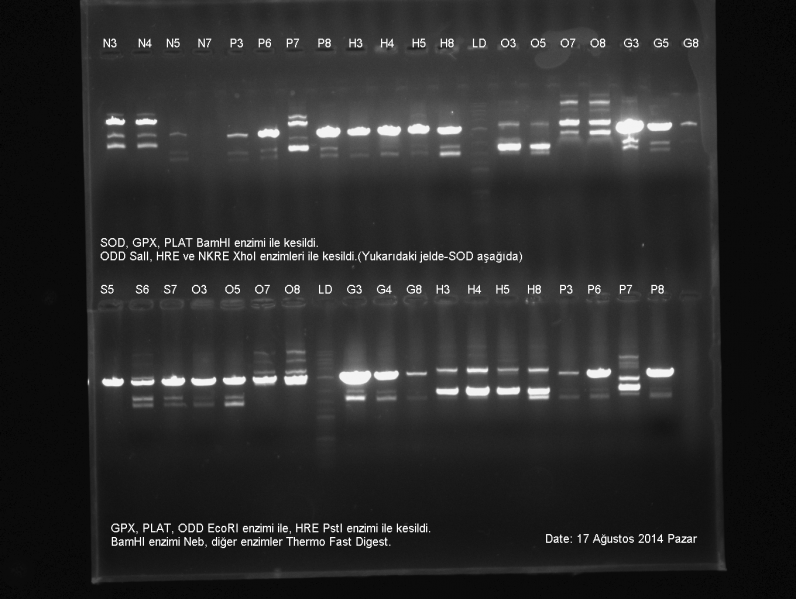 Result: ODD and PLAT samples were correct.But GPX and SOD were not that we expected. 1. We SHARED our missions in team. 2. We determined our Wki Design. 3. New members joined us. 4. 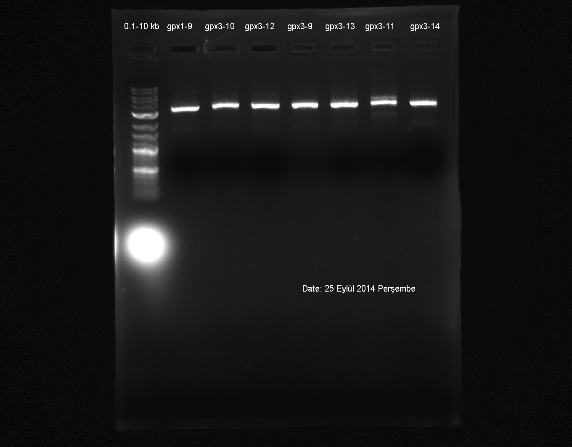 Waiting for Aprotinin gene. 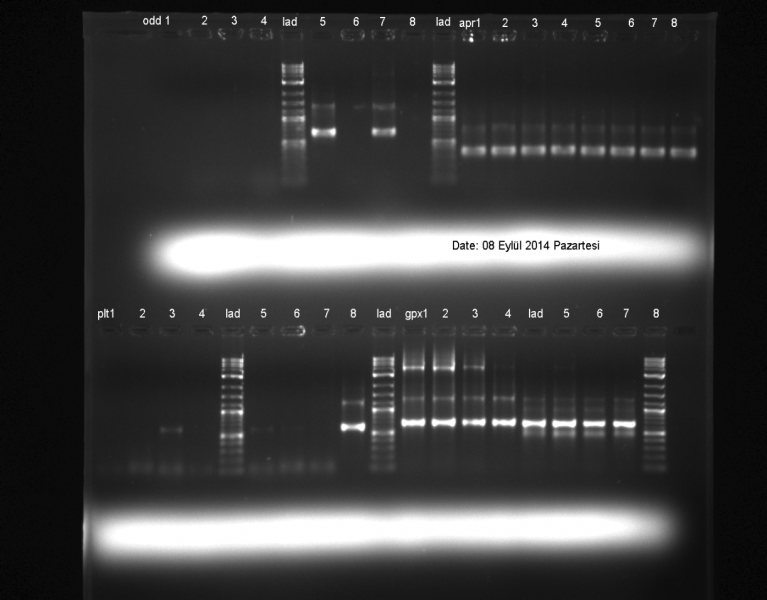 iGEM Vector and SOD ‘ s Dig-Lig-Trans. 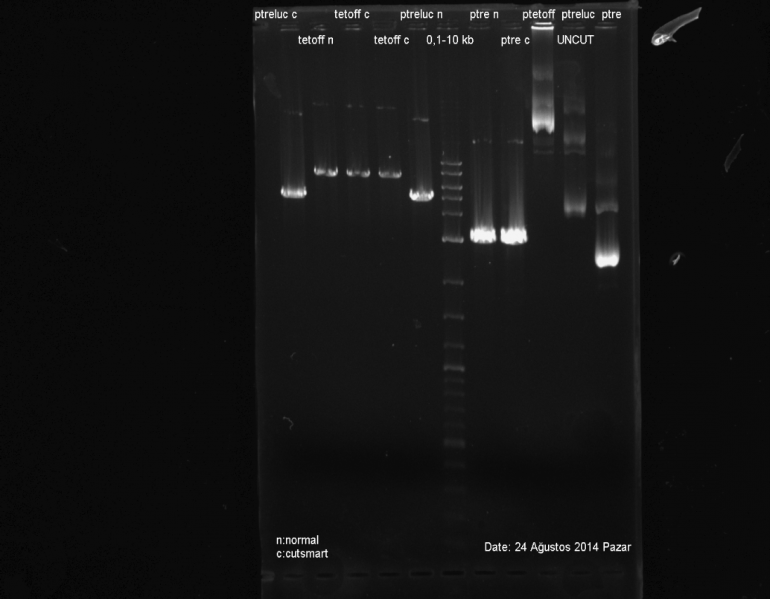 iGEM Vector(s3335) and SOD were digested (pSB1C3) with XbaI and PstI. 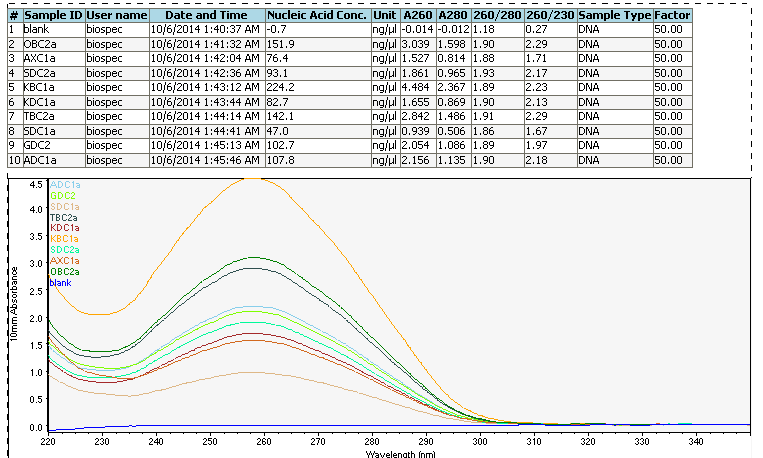 •	We use the liver cancer tissue’s cDNA.We also check our enzyme’ s temparature by gradient. 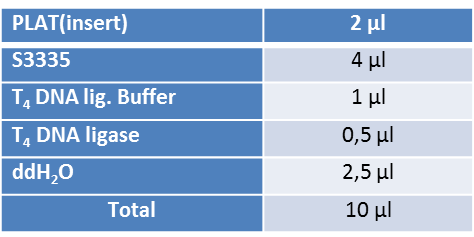 •	In measurement study, for step 1.2 and 1.3 , we replicated our parts with transformation. Also for step 1.1 , we replicated one part. 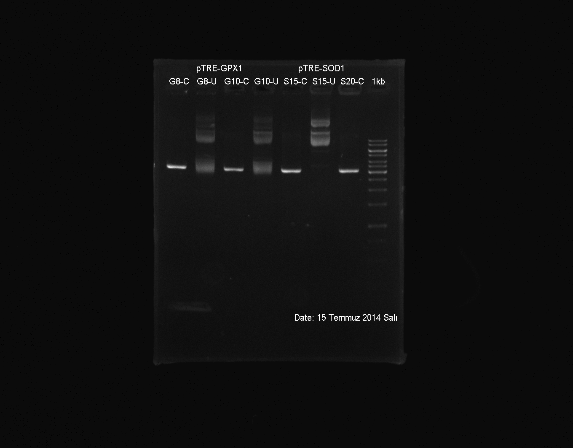 We obtained PLAT from gel extraction and digested. 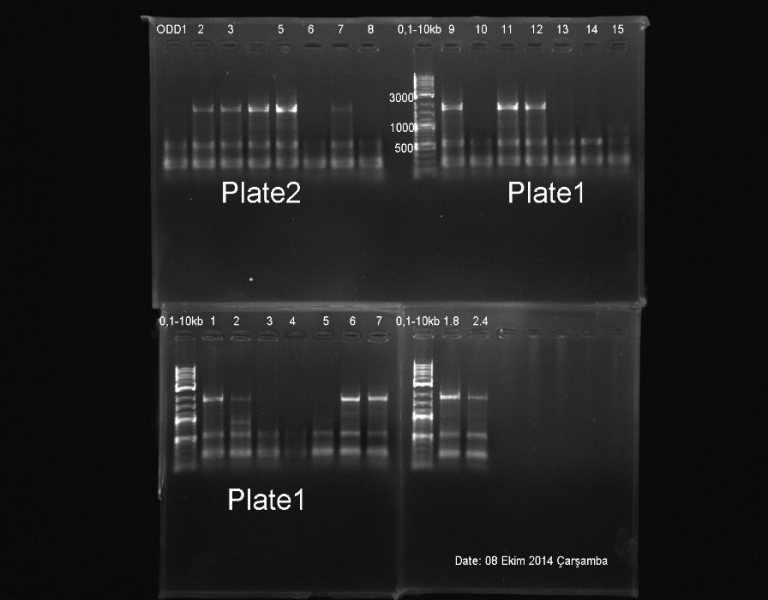 Plat and iGEM were ligated and transformated to BL21 bacterias in choloramphenicol plates. 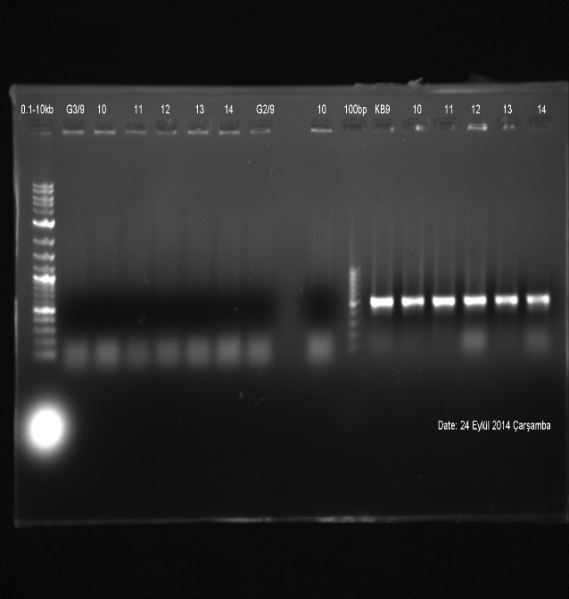 In measurement study ,E0240_1,E0240_2, I0260, J23115, J23101 are transformed to DH5α and BL21. Our some transformations were not that we expected. Because we used wrong antibiotic. E0240_1 , E0240_2 and I0260 are put into liquid culture. 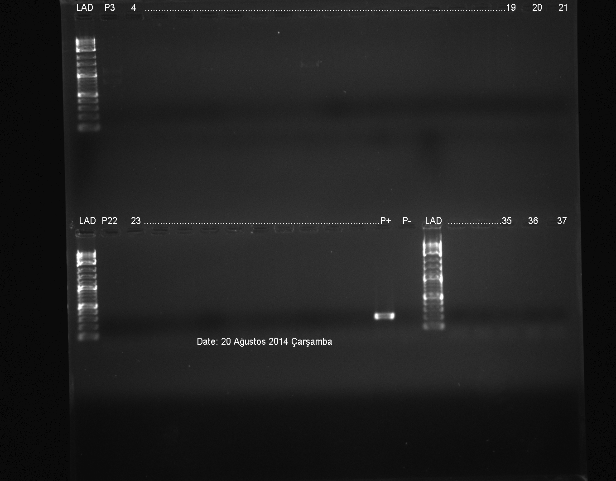 J23115 and J23101’ s transformation results were bad cause of wrong plates again unfortunately. 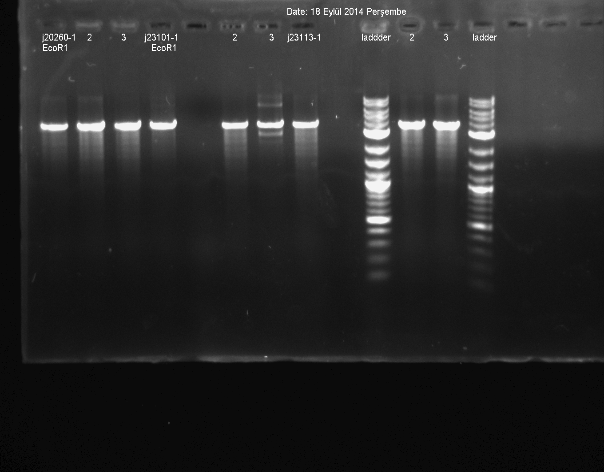 Teh good samples were dig-lig-transformed. 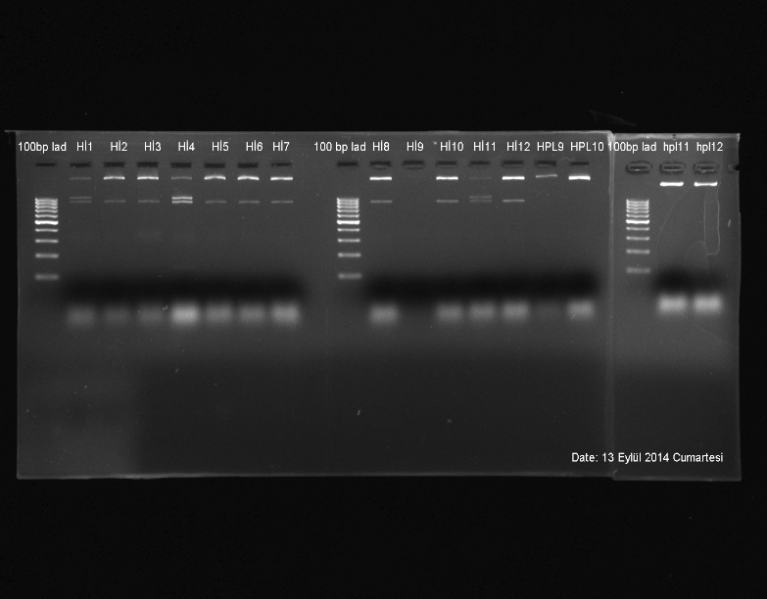 We made colony PCR for all of our genes. 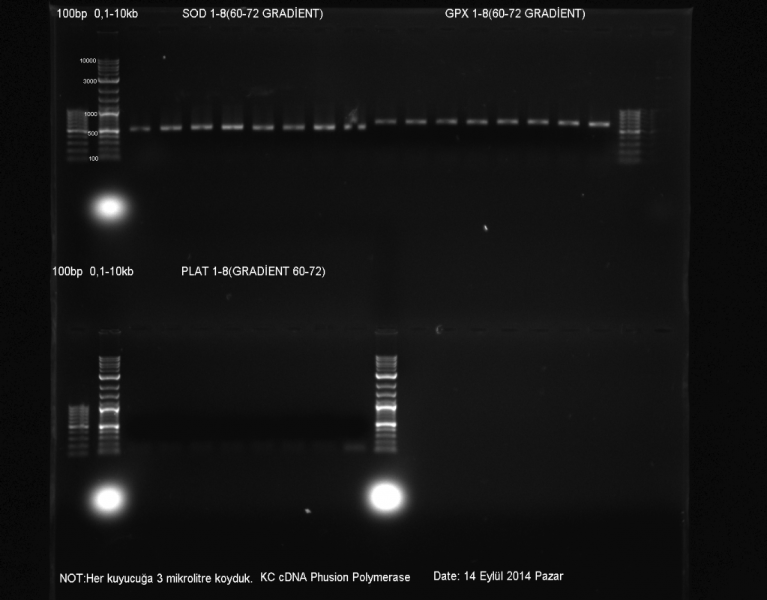 Turan digested pTet-off , pTRE and pTRE-luc. 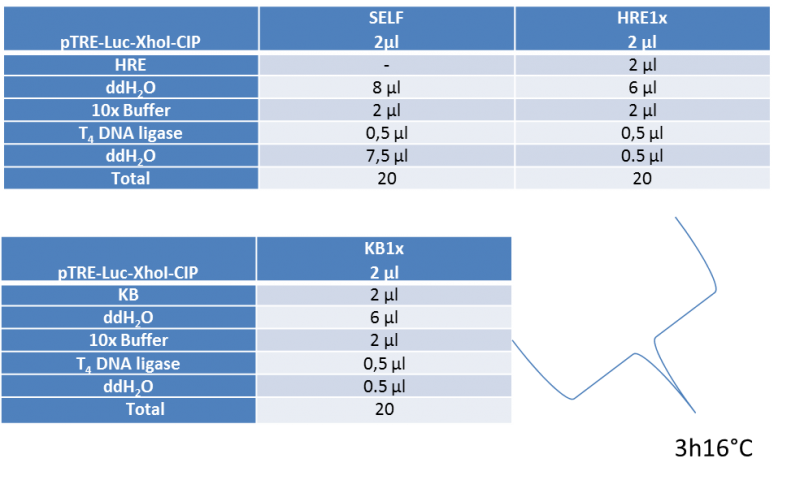 -Add 1 unit of CIP for every 1 pmol of DNA ends(about 1 mg of a 3 kb plasmid. 37°C 30 mins, 50 °C 30 mins. 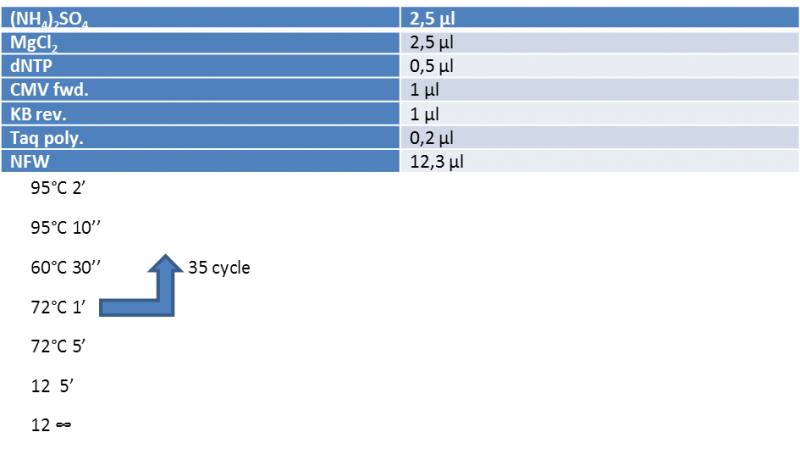 psB1C3(E,P), J23115(S,X) are digested. 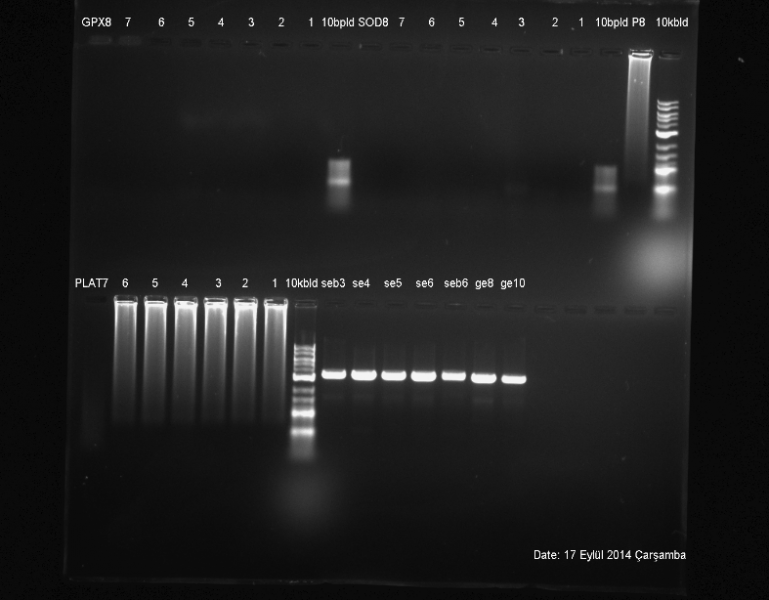 pSB1C3 and J23115, E0240 ligated. 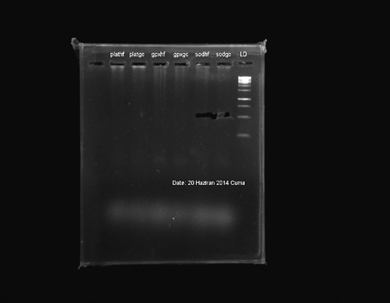 I20260 is made liquid culture. 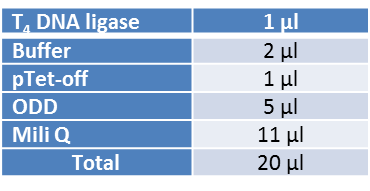 In measurement study, General Check of uncut , digested or even ligated samples. Our transformation didn’t show up lately.So we decided to revise our steps. 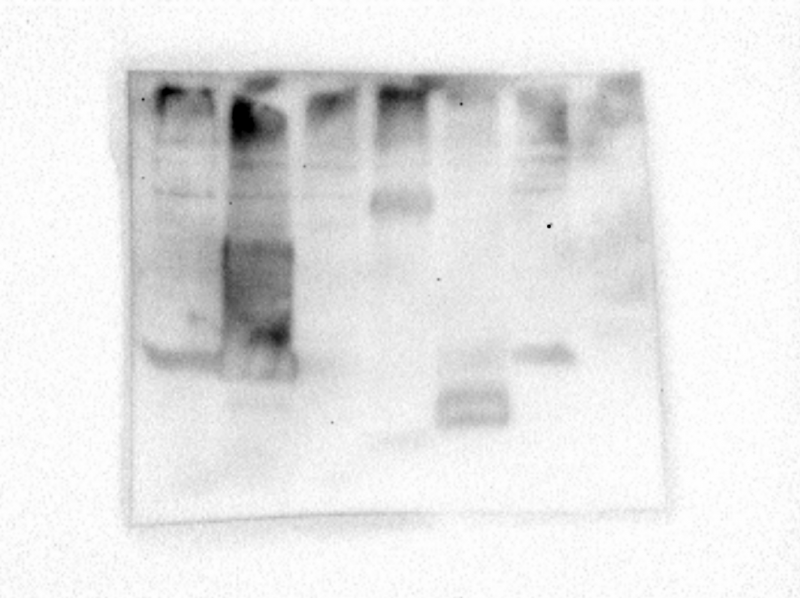 •	There isn’t anything on I23115 digested.Digestion failed. 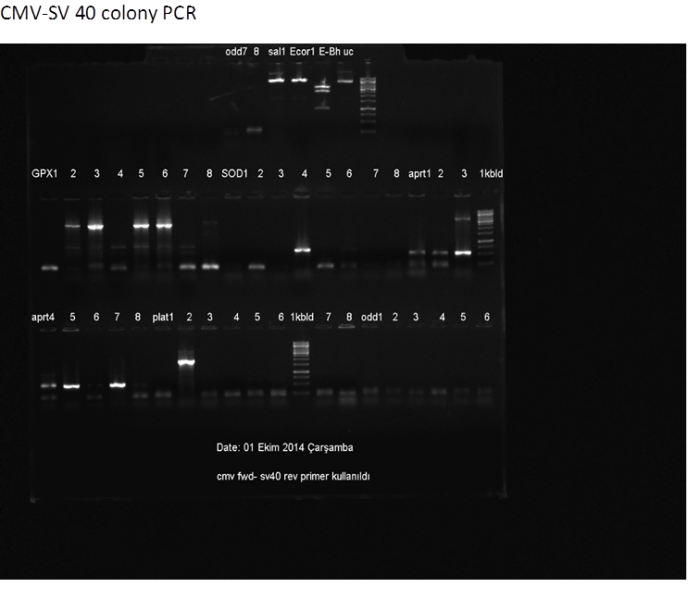 We checked our genes ODD,HRE,NFKB,PLAT,GPX,SOD with colony PCR. 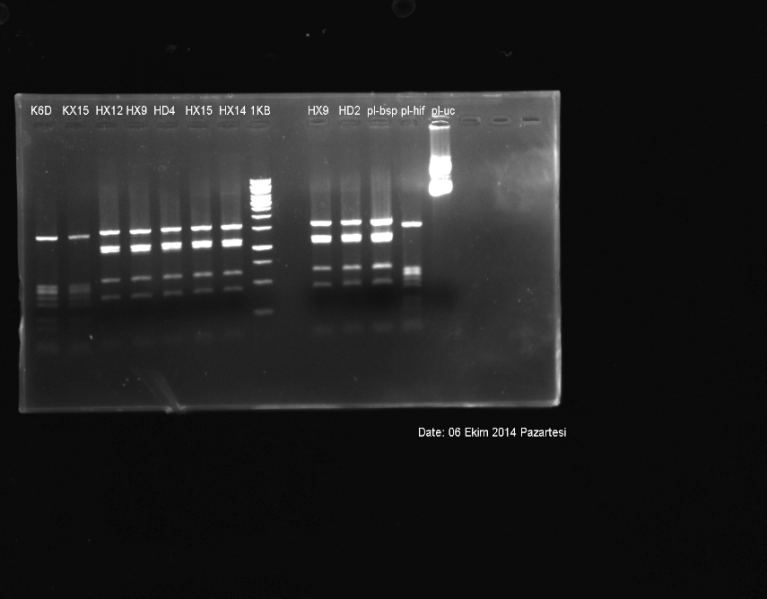 PLAT-iGEM vector was DNA isolated. 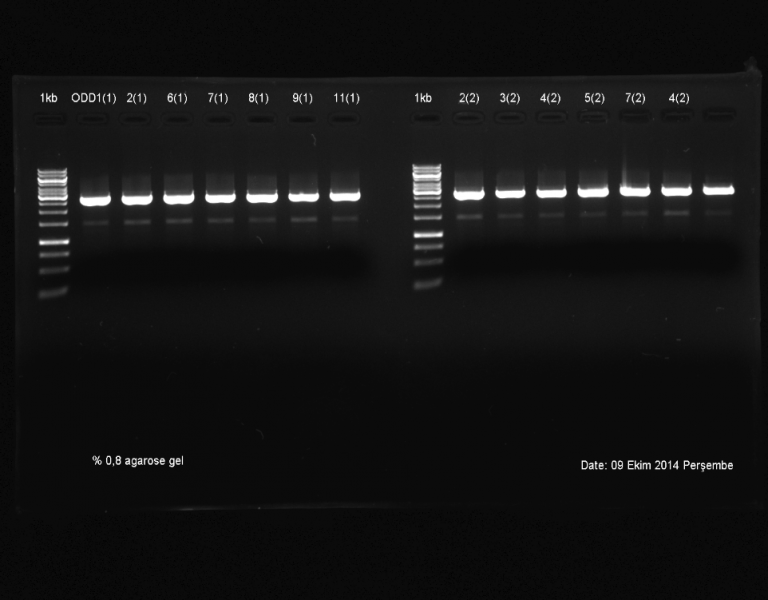 Plat-igem was digested and run gel and the results are below. 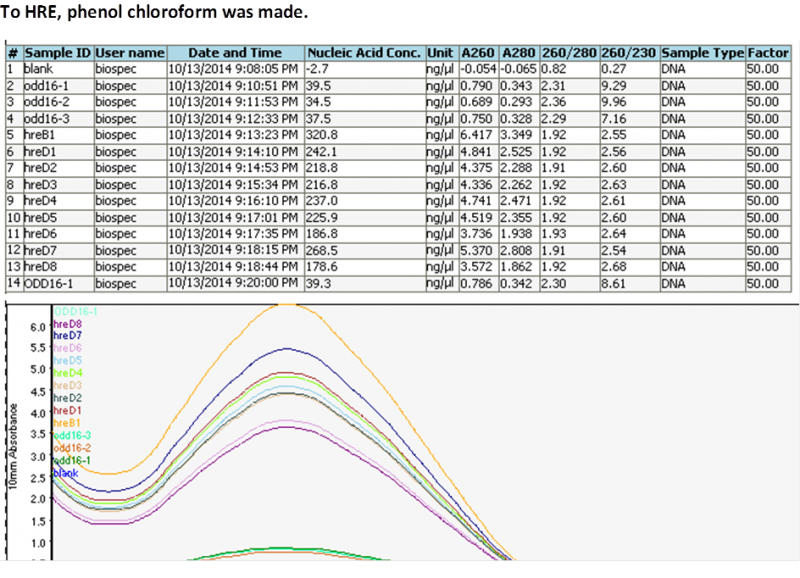 •	SOD, GPX, PLAT, ODD, HRE, NK-RE Enzyme restricted wit vectors. 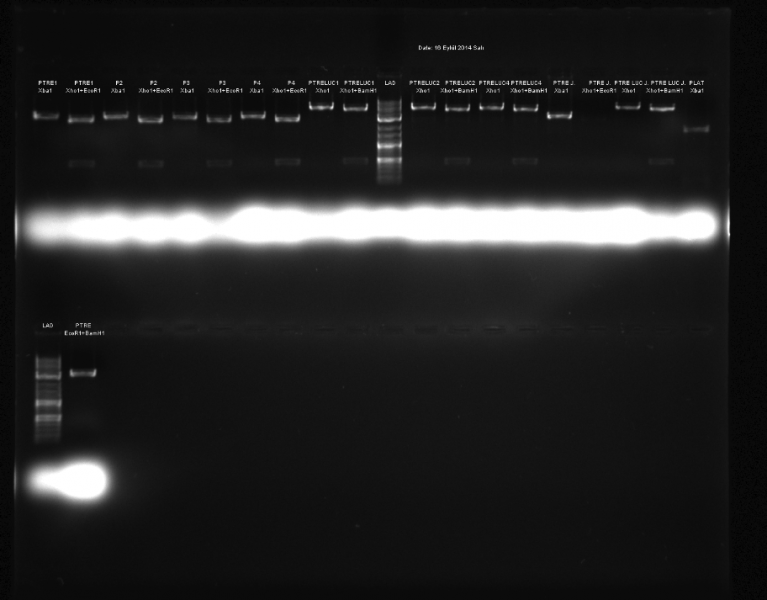 We obtained our expectated experiment results. 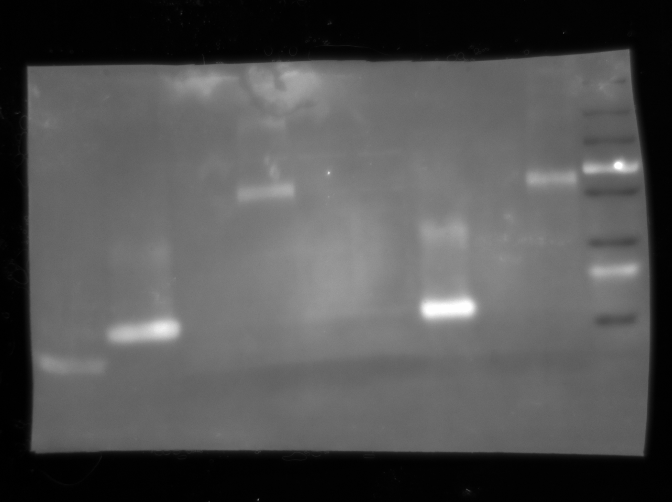 We saw our correct bands in electrophoresis. 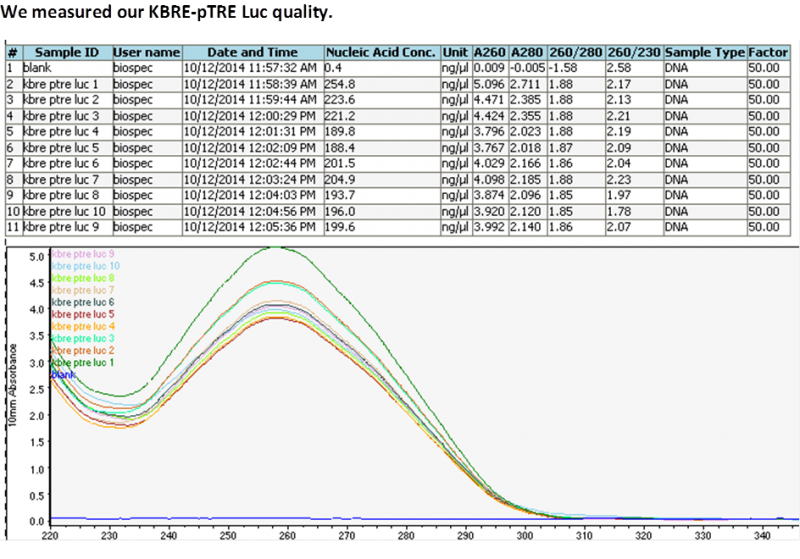 •	Pick into 17 colonies 50 µl ddH2O. 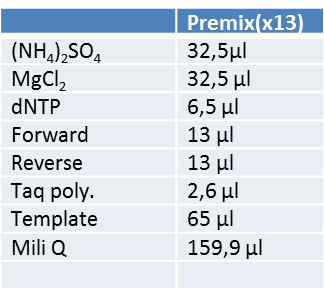 •	5 µl Template and 20 µl Master mix added to tube. 1. We discussed with Turkish Heart Foundation. 2. 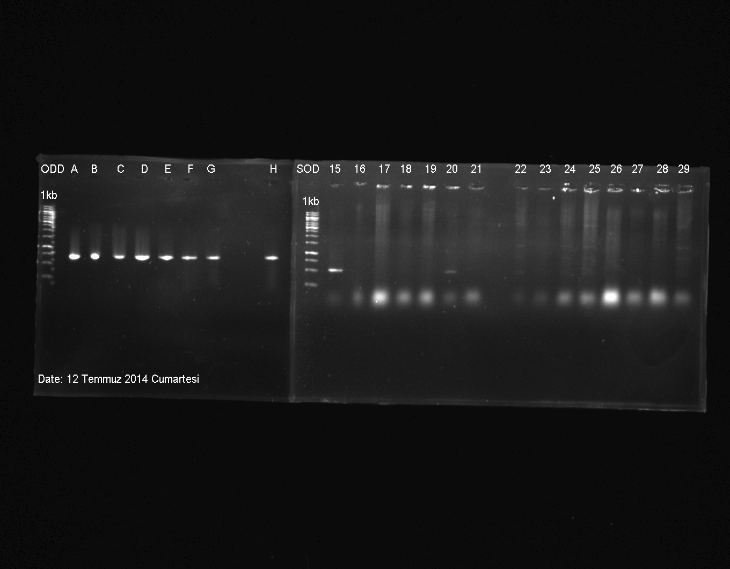 We sent our Measurement Study ‘s results to iGEM. We measured our SOD, ODD density in ND. •	We had a Victory Eid between 29.08-31.08. So had a break these dates. 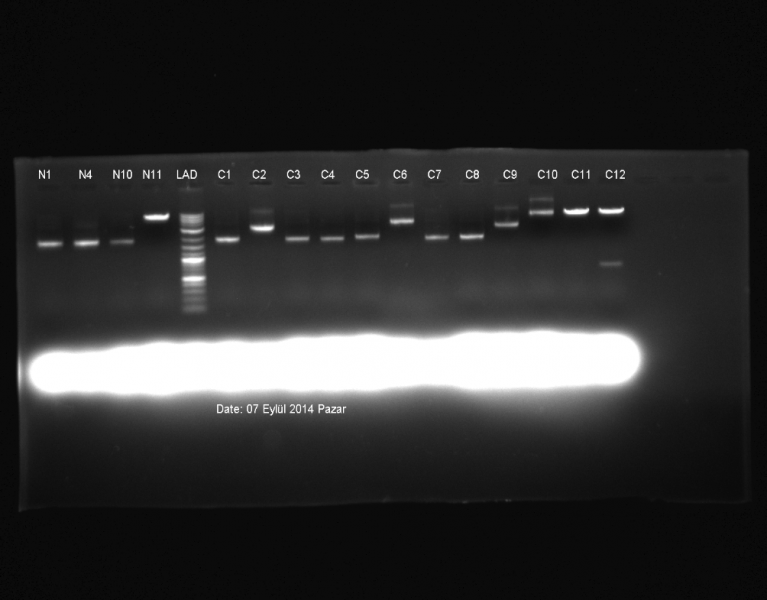 The result of our experiment we saw the C12 was entered the pTet-off vector. But when we fixed the direction of ODD, unfortunately, that was wrong. 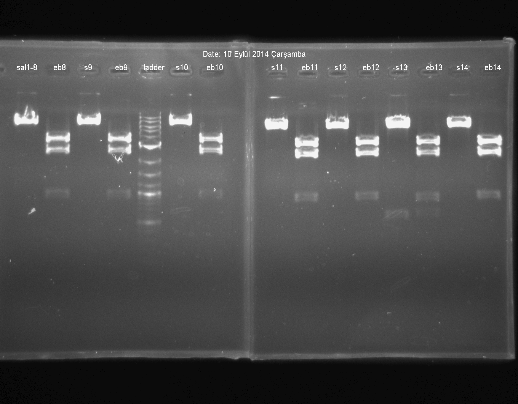 This experiment we sequenced ODD,Aprotinin and GPX and therefore made Colony pcr for our gene’s quality. 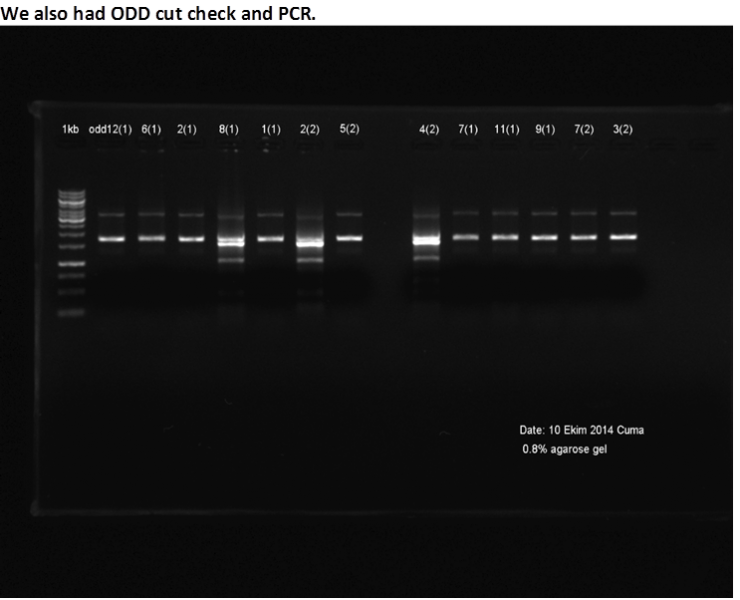 There was a eppendorf(1,5) which unknown product in it,pTet-off or pTet-ODD.So we cut unknown material with SalI,EcoRI,BamHI+EcoRI.. 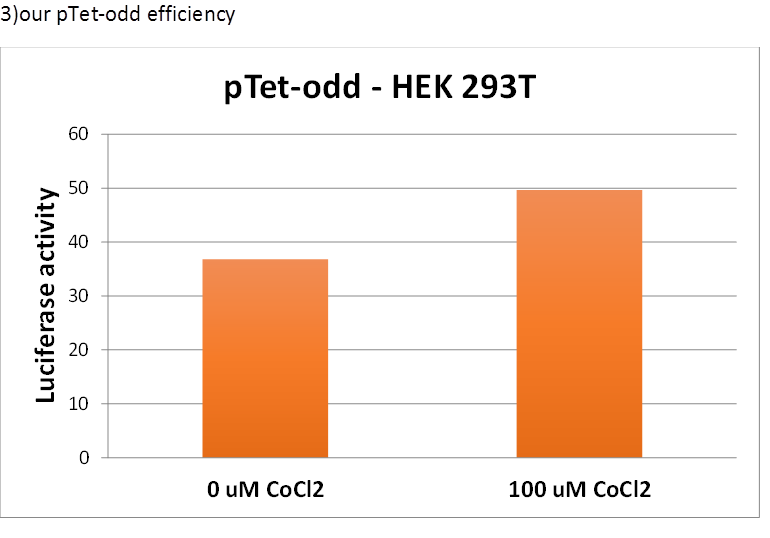 Conclusion:We learned it was pTet-ODD. Someone put into it wrong sample. 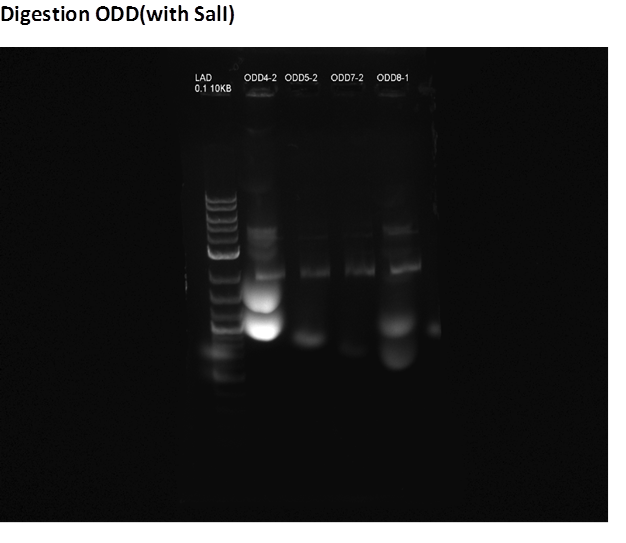 We digested pTet-off and pTet-ODD with SalI. 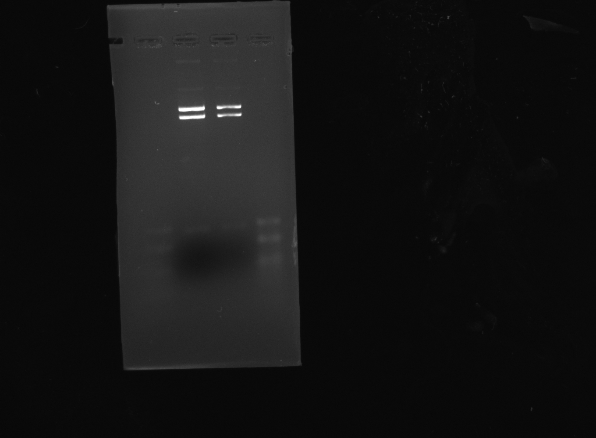 Then we Salı and B-E run in gel for control and the result is below. 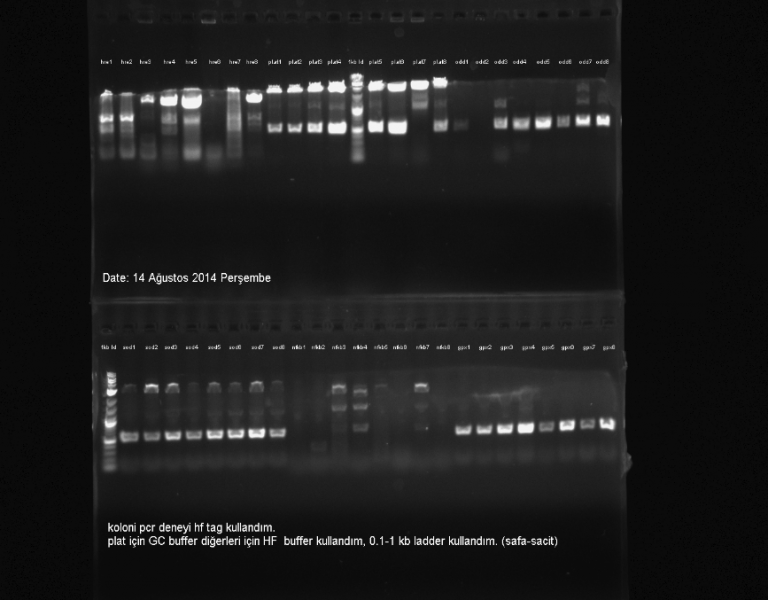 We controled our Plat,Sod,Gpx again and again because we couldn’t get our expectations on experiments. 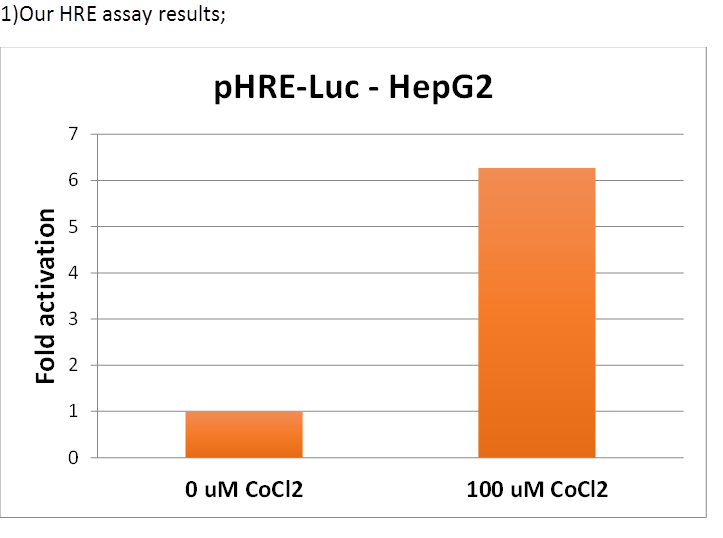 Initially, we checked HRE’s digestion and chose the correct insert. 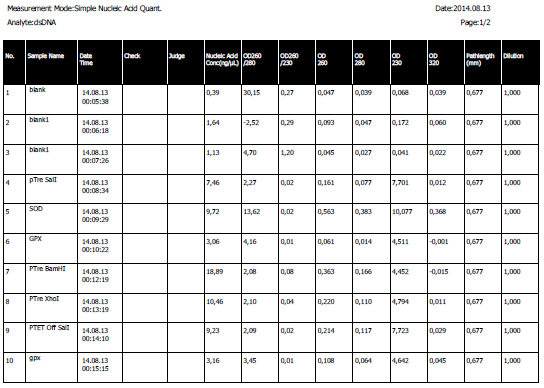 Later we wanted to threw HRE to PSB1C3 but we didn’t get result again.What a Shame!! Gradient for SOD,GPX and PLAT. And we controlled lig . of pTet-off and pTRE-ODD. 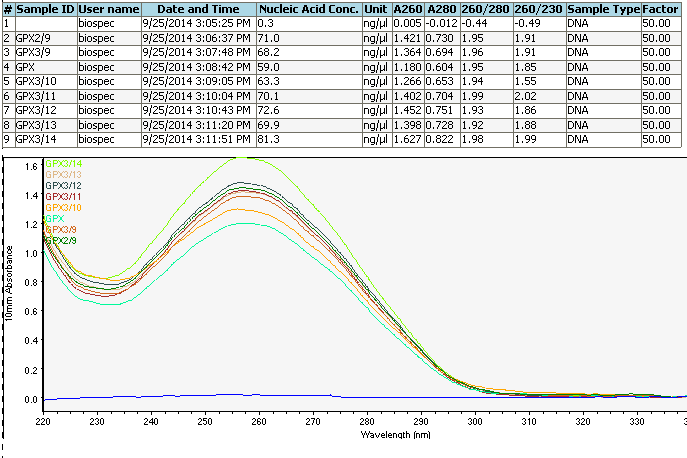 Measurement of our promoters J23101,J23115 efficiency in our BioBrick. 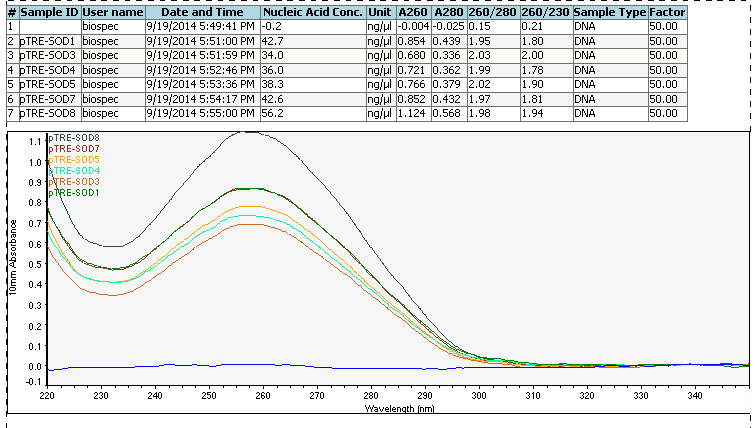 2 µl Ladder used.PCR product length was 1700 bp.For NFKB, correct band was 350(with correct insert). 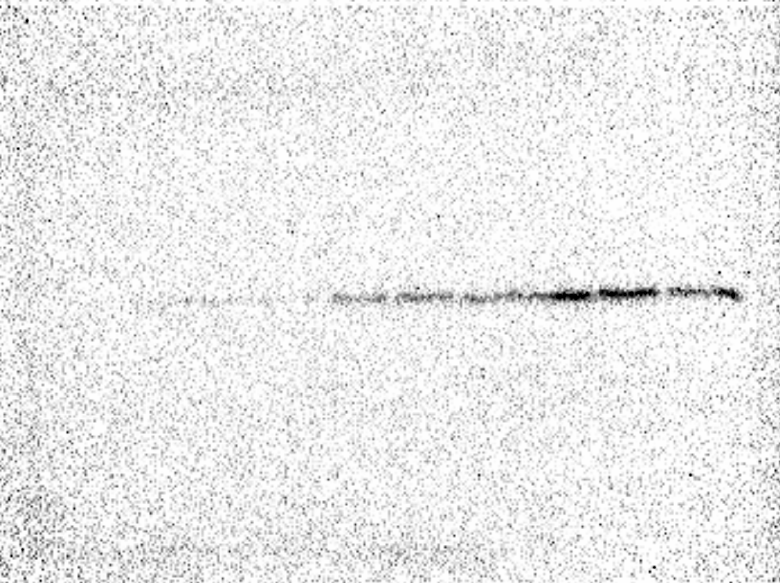 If we saw band in 300, it means insert didn’t enter to Vector.But we didn’t see these bands. 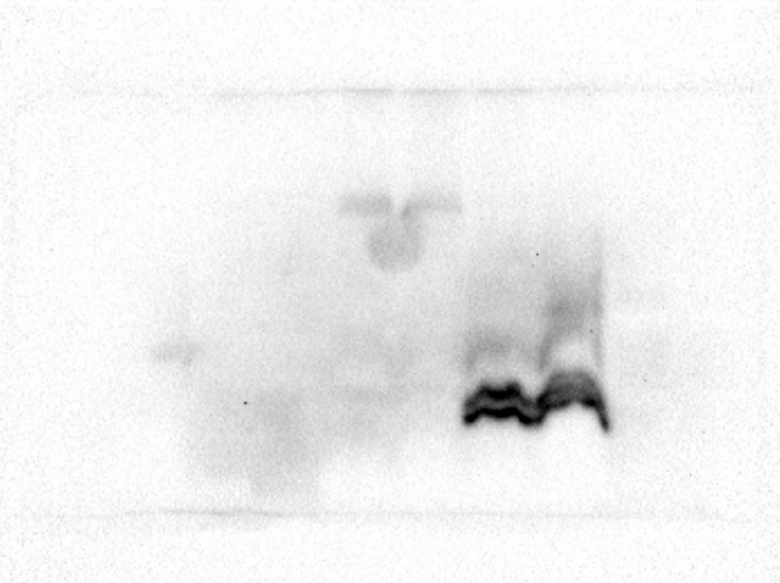 Maybe our SmaI enzyme didn’t work. That day we made ‘Digestion Party’. 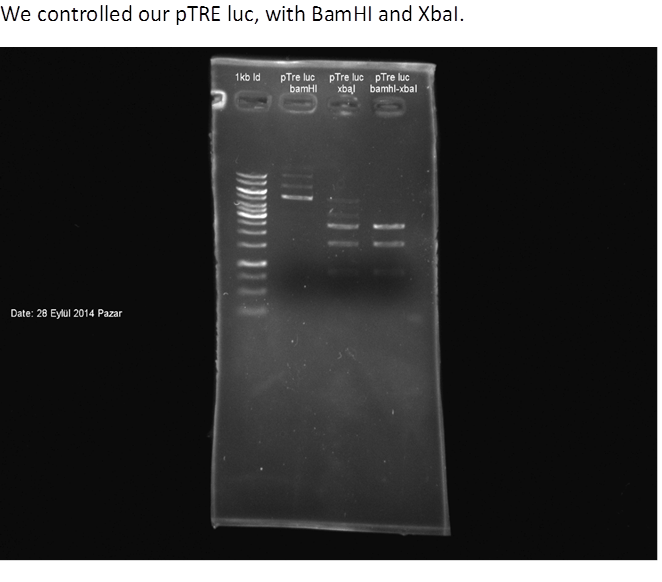 We cut pTRE and pTRE-luc with all of our enzymes for restriction sites. 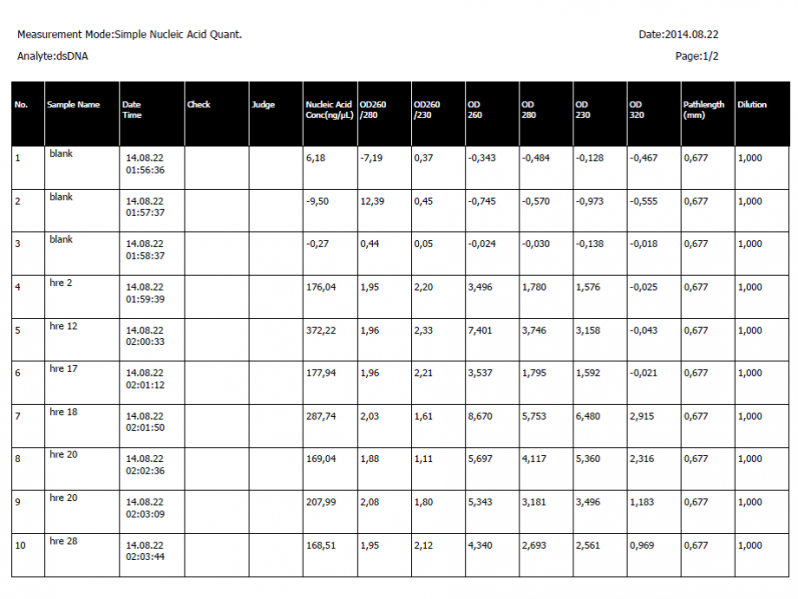 One day later we(ATOMS)checked our Measurement Study samples.That was we expected fortunately. 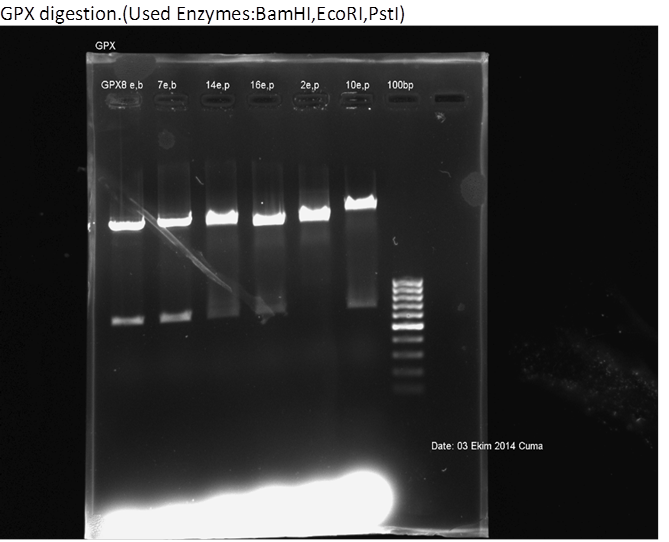 We cut our samples which correct result in ColonyPCR, with EcoRI and BamHI.1,3,4 and 7 was cut.The others didn’t reply our enzymes that unknown reason. 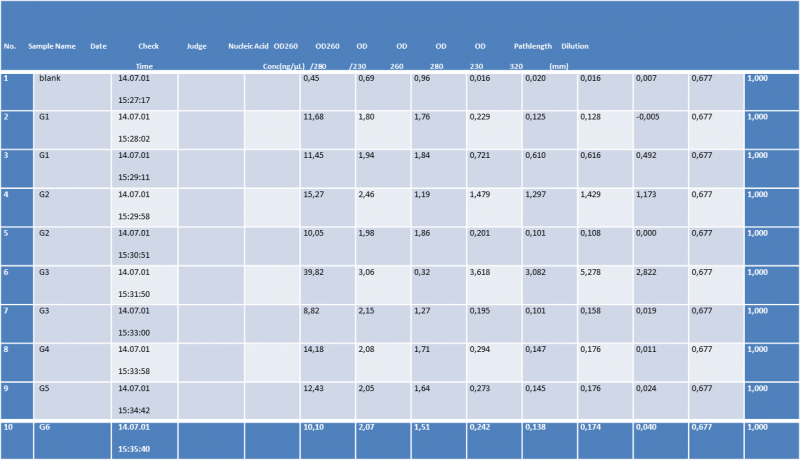 We measured our pTRE-luc quality and graphic is below. We replicated our HRE using M13 primer in PTZ57R vector. We wrongly gradient’s temparature 60-72°. 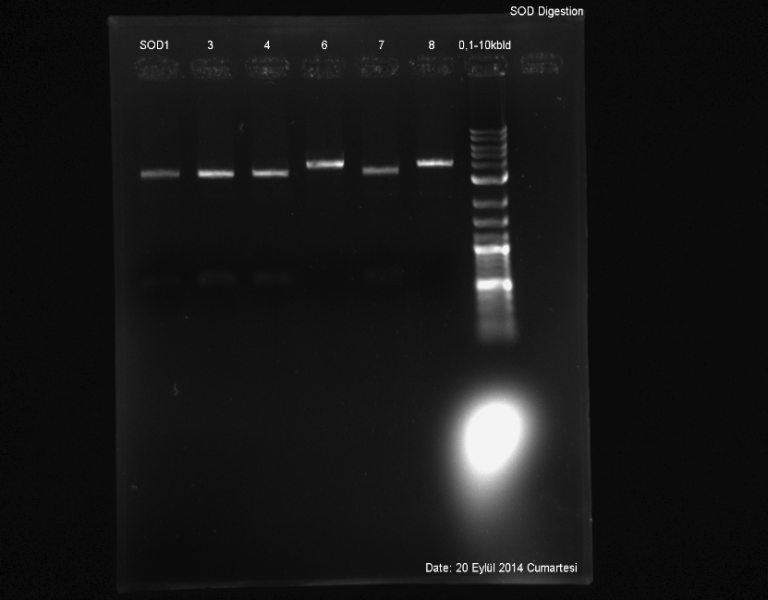 After 30 mins, altered to 50-60°.In our opinion,in high temparature,our primers linked non-spesific so we saw extra bands in EPH. 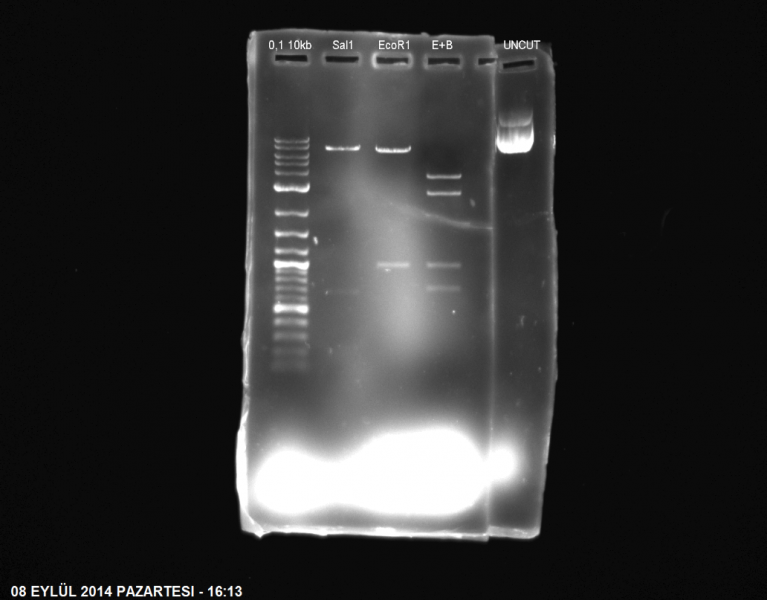 After that we made PCR our samples(PTZ57-HRE) in 57°C. used 0,1-10 kb and 100 bp ladder . 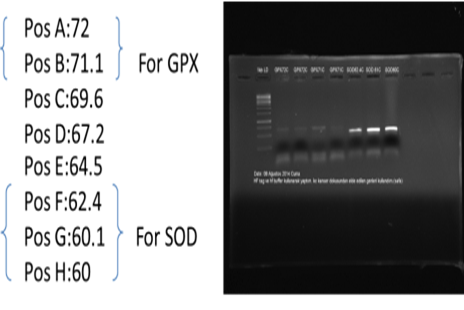 We got correct Western Blot results for SOD(3,4,7,8). 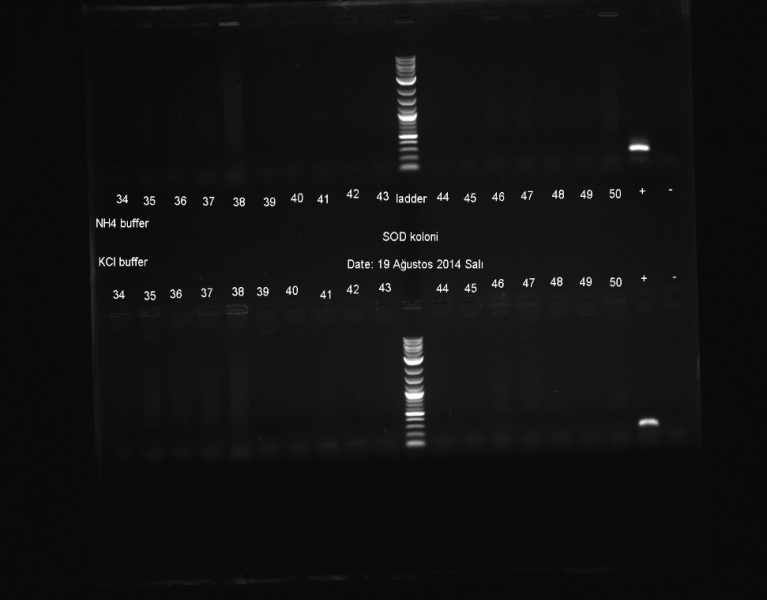 Then we made Sod assay and our SOD WAS WORKING!’!!! We also cut GPX with BamHI. 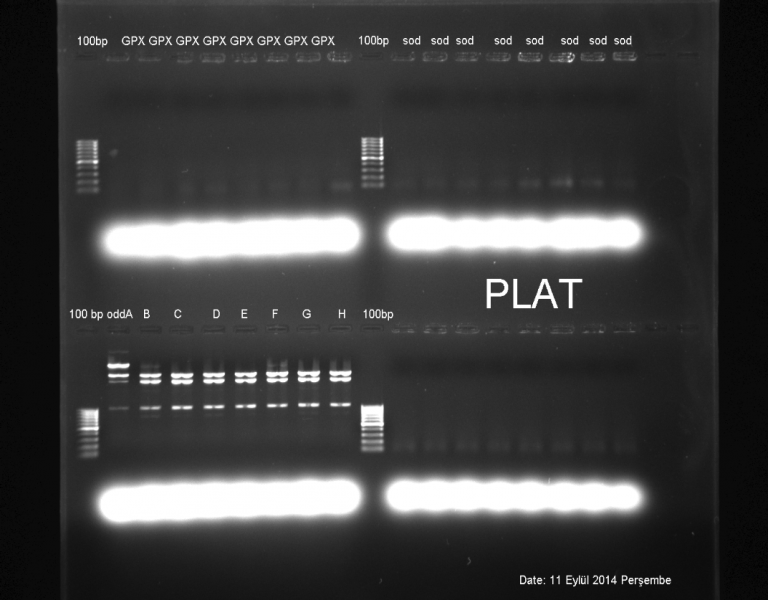 We controlled our PLAT samples between 28-32. 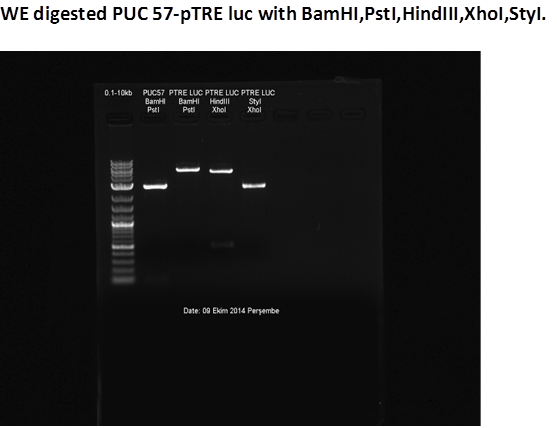 Ligation of pTRE luc with HRE. 1. 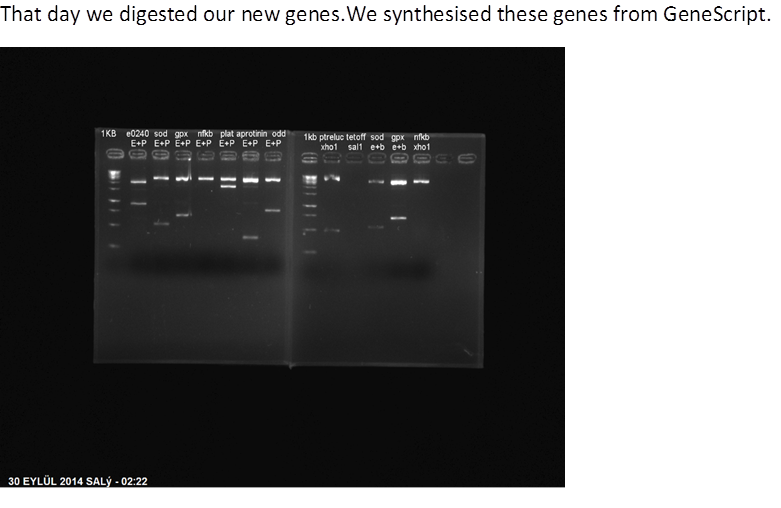 We had to work hard because we hadn’t an efficient result and we have to throw our genes to eukaryotic cells. 2. 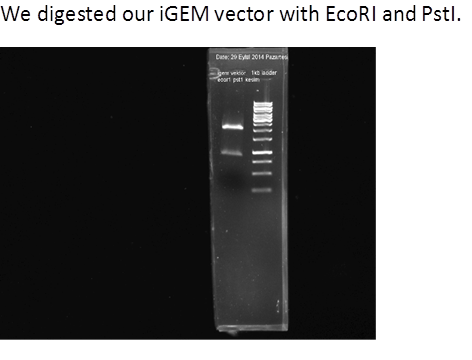 We threw our genes to iGEM vector. 3. There will be simultaneous cell transplantation . Our ODD 9 was correct. 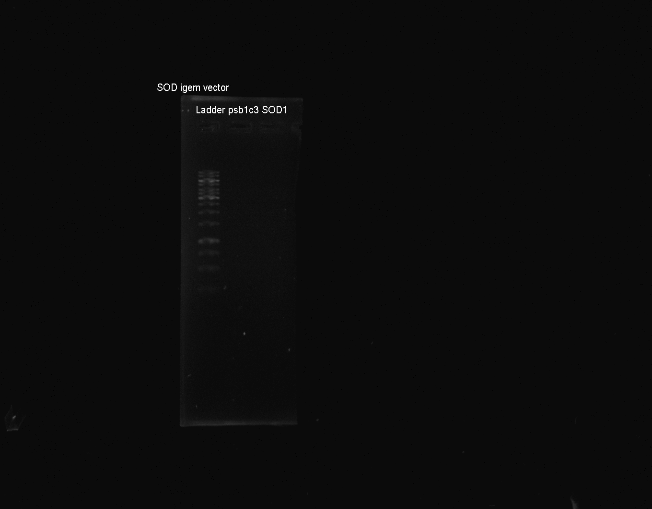 So we used this experiment. 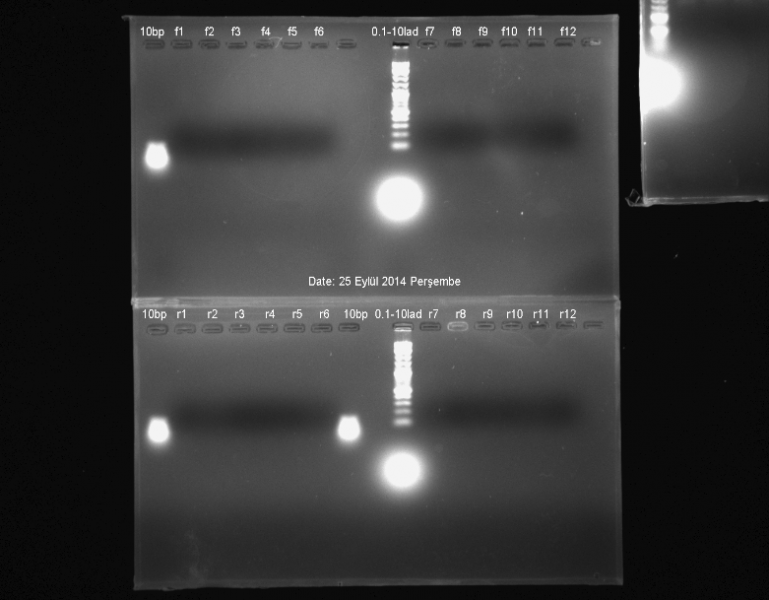 We made also WESTERN BLOT for GPX and got correct result. 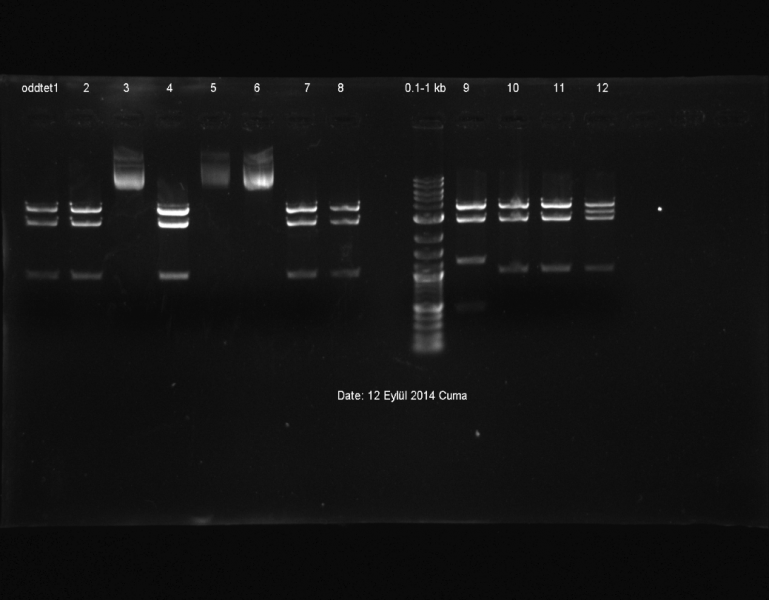 We wanted to learn our genes ,we had a confusion, we made colony PCR to our samples. We threw HRE and NFKB to pTRE-luc and seeded to different competent. 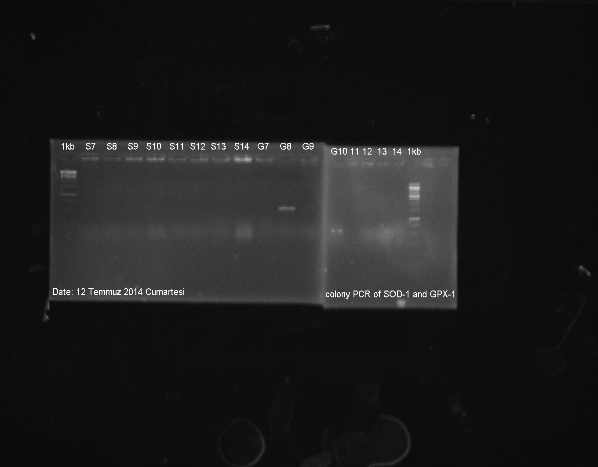 End of all, we made colony PCR(NFKB) and The result was correct fortunately. AND THE RESULTS ARE BELOW. 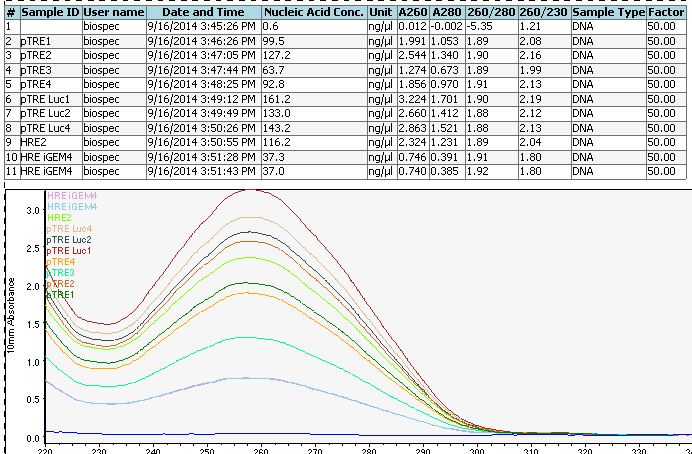 All of our enzymes’s WB..
ALL OF OUR ENZYMES IN 20 MINS. 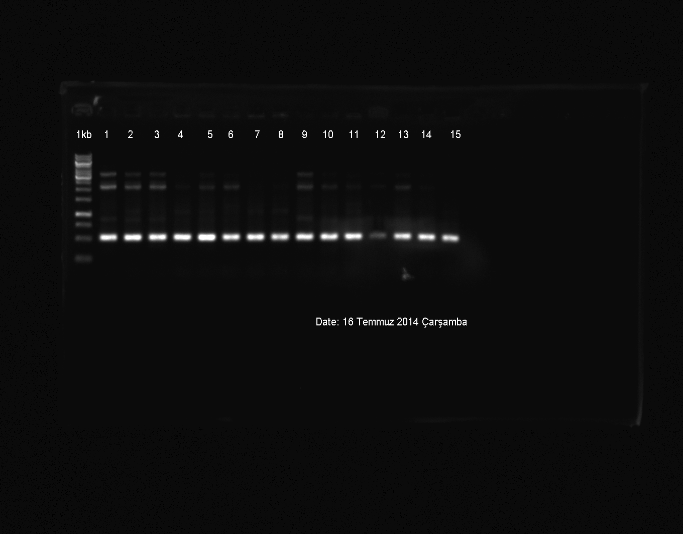 15 hours 31 mins later, all of our enymes in HEK293 cells. 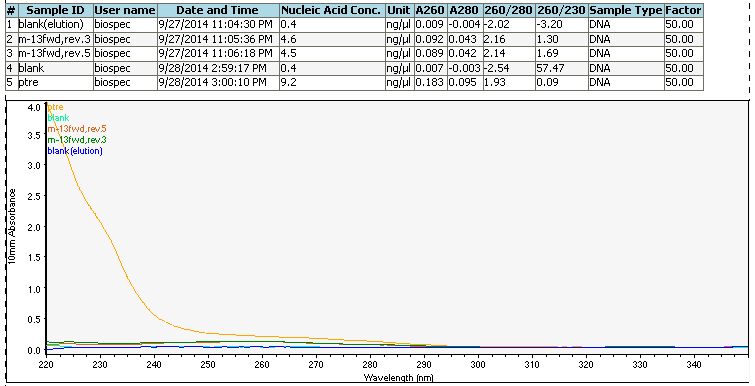 15 hours 47 mins later, 240 second vision,Enzymes,HEK 293 cells. 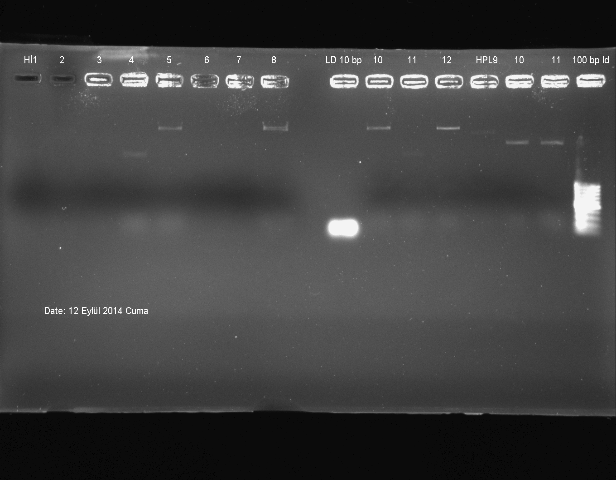 And after western blotting, we made some assays of our genes,Hypothetical,HRE, Tet-odd.